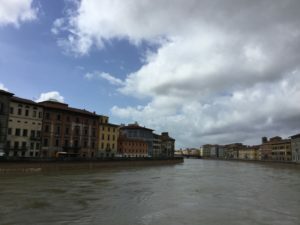 My experience in Italy was wonderful. I experienced a lot of feelings transmitted by the cities we visited and the people we met. 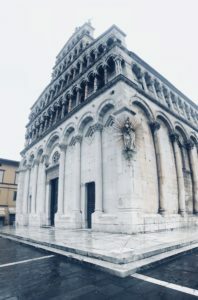 The beautifully renovated and well maintained buildings gave me a strange sensation that is hard to be describe but I couldn’t take my eyes from them, especially when we were in Pisa. I had always wanted to see the “Miracoli” piazza and the leaning tower and I was so glad I had this opportunity. I can say that with this project, one of my dreams came true. Lucca and Volterra were my favourites, too. The region we visited was very rich in monuments and I really liked it. Pontedera, where I stayed, is a small piece of jewellery of that part of Tuscany. 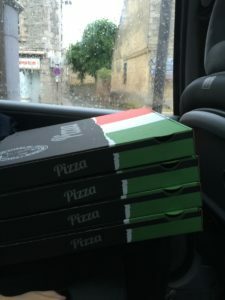 One night, the Italian team took us to an restaurant where we could eat whatever we wanted, but, obviously, we all ordered Pizza – ”the queen” of the world renowned Italian cuisine! The people were very kind to us and responded to any of our questions and the Italian students were very friendly, too. 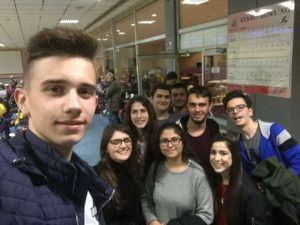 I made a lot of friends and this is something very important for the students in this project – the friendhip among us will remain after the project has finished. The area had many things to offer a tourist and I am really thinking of returning to Tuscany in the near future. I can say that the mobility to Italy was one of the stunning experience that I have ever had, and I didn’t think that it would be like that. 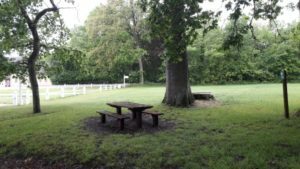 My host family became my second family for a week – I felt at home! I found out that the Italian people are very friendly and hospitable. I made some new friends from Cyprus, Turkey and, of course, Italy. I discovered the beautiful landscapes of Pisa Province: the cities of Lucca, Pisa and Volterra (my favourite!) impressed me a lot. Volterra is situated on a hill 1770 feet above the sea level. Its origins date back to the ancient Etruscans, who used to call the city as Velathri or Felathri, while the actual name comes from Volaterra, dating back to the Roman era. The Etruscan walls are still visible, well preserved and surround the city centre. I could really feel a medieval atmosphere when walking through the narrow streets of the centre. Throughout the Middle Ages, the city was home to the bishop, then it fell into the hands of Florence (and the Medici family), and, afterwards, under the Grand Duchy of Tuscany. In the heart of the medieval town we visited Piazza dei Priori with the wonderful Palazzo dei Priori, today the city hall. Its façade has ancient emblems of marble and glazed earthenware. In the same square we saw Palazzo Pretorio, whose tower is very ancient and is considered one of the first towers of the town. It is traditionally known as the Tower of the Little Pig because at the top there is a small pig in stone placed on a shelf. We learnt that Volterra was the setting for New Moon, the second vampire book in the Twilight series written by Stephanie Meyer. In the book, Volterra is home to the Volturi, an ancient group of vampires. I will never forget those places. I could practice and improve my English by speaking it everywhere and all time. I would like to visit Tuscany again. The mobility to Italy was one of the most special experiences of my life. It was a great pleasure to be part of this project. It truly opened my eyes upon the importance of tourism. I had the chance to meet amazing people, see mesmerizing sights, learn about different cultures, architectural styles and traditions. I have to mention the fact that I tasted so many new flavours in Italian foods – the pasta and pizza were the paradise of my taste buds. The whole mobility was a great way to socialize, improve my English and learn everything about the important things of Italy’s tourism. I would have stayed a lot more there. The host family was so kind to me that it made me feel like at home. The students were also great! – all of them had good sense of humor. They were all respectful, kind, smart, well prepared mentally as well as psychically for taking care of us. We could easily get in touch with each other so we could build strong friendships (we still keep in touch!). The communication was easy as we could talk about anything with the other students as everyone had a good command of English. The architecture of Volterra was the most beautiful for me. We had the chance to visit an enormous fortress-like city with wonderful viewing spots, architectural structures and buildings. The greatest event was when we visited a century-old palace. Its owner was a noble man who still lived in the building. Most of the constructions in Volterra are like exhibits in an open air museum. I would like to go back to Pontedera and meet my Italian friends as soon as possible. It was an amazing trip to Italy. I had a great time, I met new people and I made new friends. We visited towns in Italy that I never expected that existed. One of the most beautiful towns was Lucca which is one of the most loved cities in Tuscany. We saw Lucca’s green walls and the park that you can go for running, ride a bike or just for a walk to relax. 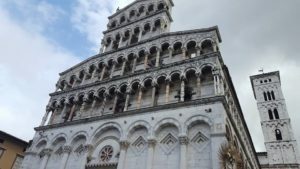 We also visited the San Martino Cathedral, the Guinigi tower and the University of Lucca. 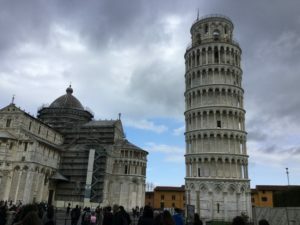 One of my favourite visits in Italy was in Pisa on 16th of March. I always wanted to see the Leaning Tower of Pisa. You have the chance to discover the tower by climbing more than 294 steps in order to reach the top. I have to say that I didn’t want to go before but now I want to go again and again. There are amazing monuments and towns that you can visit when you go for holidays to Italy. I hope that I will have the chance to go again one day to visit and learn more about this beautiful country. Μια από τις καλύτερες εμπειρίες της ζωής μου βίωσα την εβδομάδα 12-16. Μαρτίου . Την εβδομάδα εκείνη επισκέφθηκα την Ιταλία στα πλαίσια του ευρωπαϊκού προγράμματος Erasmus +. Στις 11 Μαρτίου ξεκίνησε ένα ακόμα μαγευτικό, κουραστικό, συναρπαστικό, ονειρικό ταξίδι που με εφοδίασε με εμπειρίες , γνώσεις και καινούργιες φιλίες όπου πολλά από αυτά θα κρατήσουν μια ζωή. Μετά από αρκετές ώρες σε αεροπλάνα , λεωφορεία και αυτοκίνητα καταλήξαμε στον τελικό μας προορισμό, την μαγευτική Ποντετέρα. Ένα καταπράσινο γαλήνιο φιλόξενο και αγαπητό τοπίο και άνθρωποι μας περίμεναν για να μας δείξουν ένα μικρό κομμάτι αυτής της υπέροχης χώρας, της Ιταλίας . Η αναμενόμενη εβδομάδα έφτασε και από την μια στιγμή στην άλλη βρεθήκαμε σε ένα σχολείο μέσα στο πράσινο . Ένα σχολείο στη φύση . Σε ένα ονειρικό τοπίο όπου τίποτα δεν θύμιζε την τσιμεντούπολη . Στην αίθουσα ένας μαγευτικός ήχος από πέντε διαφορετικές χώρες της Ευρώπης και πολλά καινούργια διαφορετικά και εντυπωσιακά πρόσωπα να εμφανίζονται στα μάτια μας. Ήταν οι “συμμαθητές” συνοδοιπόροι και συνταξιδιώτες για μια εβδομάδα . Ήταν οι μελλοντικοί μας φίλοι . Το καταπράσινο τοπίο με συνεπήρε και ήταν εκείνο που με έκανε να χαράξω μέσα μου ένα ακόμη μαγευτικό ταξίδι . Μέσα σε 5 ημέρες επισκεφτήκαμε 3 υπέροχα μέρη , τη Lucca, τη Voltera , τη Πίζα . Μέρη με απίστευτη θέα και φανταστικά αξιοθέατα που όπως μας είπαν και οι μαθητές- ξεναγοί μας το καθένα έχει τη δική του ιστορία . Φυσικά η περιδιάβαση στην πόλη της Ποντετέρας δεν θα έλειπε . Φεύγοντας γεμάτοι εμπειρίες, γνωριμίες, αναμνήσεις και φιλίες και στις αποσκευές μας να έχουμε όλα όσα μάθαμε, δεν ξεχάσαμε να δώσουμε το δικό μας μήνυμα πως όταν υπάρχει αλληλοκατανόηση όλες οι ταξικές διαφορές μεταξύ των χώρων διαγράφονται και κλείσαμε την εβδομάδα δίνοντας μια υπόσχεση πως κάπου κάποτε θα ξανασυναντηθούμε και θα αναβιώσουμε την εβδομάδα εκείνη . Το συναπάντημα πολιτισμών τότε ήταν στην Ιταλία την επομένη φορά που θα είναι άραγε; Θα το ανακαλύψουμε όλοι μαζί . It all started on Sunday the 11th of March. As it’s obvious, in the beginning I was filled with anxiety and curiosity about what would happen next and how everything would be. On Sunday at 5:40 in the morning, our adventure began. We had our first flight to Athens and after that, we went to Rome. In fact, as Rome is famous for its monuments and its history, we had a tour to its greatest historical sights which were wonderful. 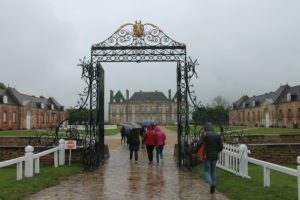 Unfortunately, after a while, it started raining and we had to leave. I can honestly, entitle this experience as one of my most strange experiences, while running in the rain. Our next destination was Pisa. Just as we arrived at Pisa airport our host families came and picked us up. A few minutes later we were in our new, cozy houses with our host families. The next day ( Monday) we had a meeting in their school where we saw some presentations made by Italian students and we also introduced ourselves to the other students. Moreover, we played some icebreaking games, after we were divided in teams. 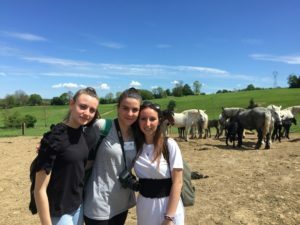 When we finished our activities, our hosts brought us to Pisa where we had an enjoyable time discovering the city, shopping, buying souvenirs and looking around. When we came back, we had free time to spend with our host. We decided to go all together to a pizzeria to taste some original Italian flavors. Undoubtedly, every day was special! On Tuesday we had a programmed trip to Lucca, a beautiful city in Tuscany. 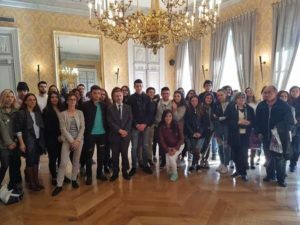 There, some Italian students organized a guided tour to Lucca’s most important sights such as Piazza d’el Amfiteatro, San Michele in Foro and others. Sadly, once again we were disturbed by a heavy rain storm. 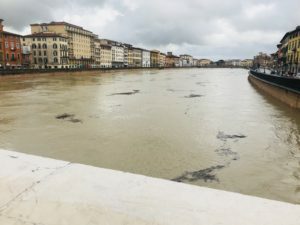 Although, rain was really annoying I had a fun time in Lucca with my new friends from the other countries, especially when we had the freedom to go wherever we wanted. As it was programmed, we got back home in the afternoon and then we had free time to spend with our host families. 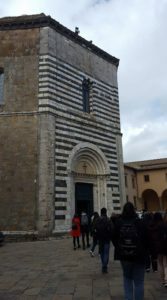 Wednesday was also a remarkable day because the weather was great and Volterra, another graphic city of Tuscany, was awesome. We spent a lot of time visiting the city’s well-known spots being very well guided by the Italian students. 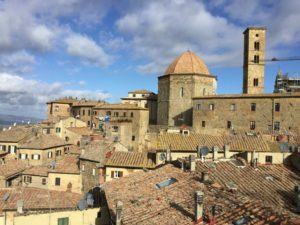 Personally, I was fascinated by the architecture and the structure of Volterra due to its magical appearance. We also had an expedition to Alab’ Arte’s laboratory which is the only place that represents the sector of artisanal alabaster sculpture. Additionally, we spent a lot of time exploring the small, graphic alleys of Volterra. After a marvelous but tiring day at Volterra, we came back home late in the afternoon and we spent a relaxing evening at home. combinaram irmos conhecer a cidade de Pisa. pela cidade e pelos seus monumentos. tarde visitamos o palácio Viti. fizemos um peddy-paper pela cidade para conhecermos os seus monumentos. andamos ás compras para lembranças para os nossos familiares e amigos. 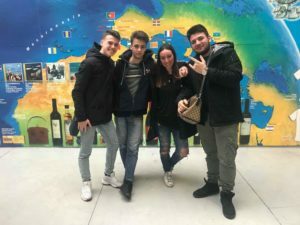 During the week of 12 th to 17 th of March, we visited Italy for our ERASMUS+ Project. made new ones from different countries. program for the week and explore the cities. Then, we were given a tour of their school. ancient buildings in Volterra and finally the Pallazo Viti. On Thursday, we discovered Pontedera with the groups that we made on the first day. had to write some reviews for Visit3V. sad to live Italy and our friends. sleeping in a bed which wasn’t ours. Quite strangely, it didn’t feel strange at all. probably one of the cities that most fascinated me. had lots of fun, but we were also very tired. pictures. It’s definitely something I will never forget. amazing day. The last one also. It had been a fantastic week. most incredible people and that will always be a part of me. J’ai été accueillie chez Gaia. cours sur le tourisme à l’université. Je suis allée à Pise, j’ai grimpé les 296 marches de la tour penchée. professeurs d’avoir organisé le projet Erasmus +. We left Alençon at midnight towards Paris, then we went to Orly airport. On Monday, we visited the school, there was a coffee break i was surprised by salty food. I was surprised because the school looked like a factory !! tourism was too difficult to understand however i learnt a lot about the skills to get a job in the tourism sector. alabaster shop and I took a lot of pictures. On Thursday, we stayed in Pontedera, in the morning we did a team treasure hunt. Then we went to visit the Piaggio Museum where we admired the Vespa motorbikes, it was very interesting. 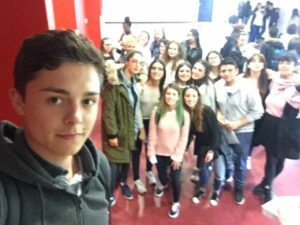 We interviewed Giovanni, an Italian student with questions that we had prepared, he answered all our questions because he is an enthusiast. Finally we went to visit the tourist office of the city of Pontedera. In the afternoon we stayed in the high school to use the Visit3V app and Kahoot, we spent a good time together. On Friday, we went to Pisa to visit the city. The view from the leaning Pisa was beautiful. We climbed 294 steps! 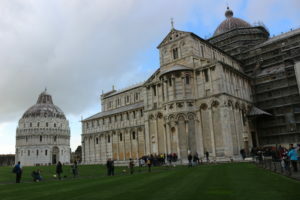 We stayed in the afternoon in Pisa with some Italians to walk around, we went shopping. Before the Portuguese students left we had a coffee on the terrace of a bar it was very friendly. On Saturday morning, we had lunch at the hotel and we went towards the airport. Thanks to all the teachers who organised this stay with the Erasmus +program, I think I had a great week, it was a fantastic experience !!! -This week in Italy was very nice, I met many amazing people during the stay. the Italian teachers and students explained us what we had to do for the week. mountains well-known for the beautiful landscapes and the alabaster workshop. Volterra was my favourite day of the week. tower, its Square of Miracles ,monuments, museums and shops. it was excellent and I loved going to the restaurants and bars. to visit and there’s a whole selection ! Dimanche: Arrivée en Italie le matin à l’aéroport de Pise puis les familles italiennes nous ont accueilli à Pontedera. 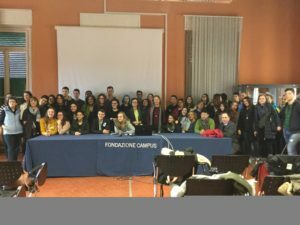 Lundi: Le matin, nous avons visité le lycée technique et professionnel à Pontedera et avons participé à des activités “ice breaking”. L’après midi avons visité Pise avec nos correspondants. J’ai fait du shopping. Mardi: Le matin nous nous sommes rendus à Lucca, pour visiter l’université et assister à un cours sur le tourisme. Nous avons visité les endroits les plus connus de Lucca et avons fait les magasins. 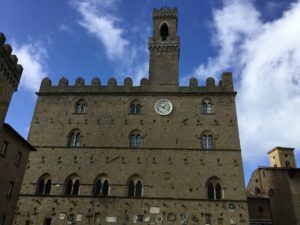 Mercredi: Nous sommes partis le matin passer la journée à Volterra, ville pittoresque dans les montagnes, J’ai aimé la visite du palais”Palazzo dei Piori”. Un artisan nous a montré la fabrication d’objets en albâtre. Jeudi: Nous sommes restés à Pontedera, le matin nous avons fait une “chasse au trésors” puis nous nous sommes rendus au musée Piaggio où nous avons interviewé Giovanni sur les deux roues de la marque Vespa. Les élèves des six pays ont fait un compte rendu par écrit l’après midi. Vendredi: Cette dernière journée nous l’avons passée à Pise, les élèves italiens nous ont montré les lieux célèbres de la ville, la cour des Miracles, la cathédrale. Bien sûr nous sommes montés en haut de la tour penchée. J’ai été accueillie par une famille très gentille, j’ai passé une très bonne semaine, je les remercie énormément. – and to my friend Sarah and to her family. Nous avons atterri le dimanche 11 mars 2018 à l’aéroport de Pise. A notre arrivée au point derendez-vous avec les familles, mon correspondant Giovanni est venu me chercher, il a chargé mesbagages dans la voiture et nous sommes allés chez lui. Lundi 12 mars, nous nous sommes rendus au lycée où les cours commencent à 8h00. 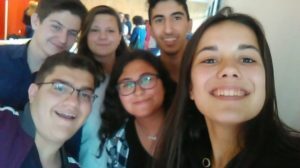 Nous avons entamé la journée par une visite du lycée, puis l&#39;après- midi nous avons eu quartier libre, nous avons visité Pise avec les autres élèves d&#39;Erasmus +. Mardi 13 mars, nous sommes allés à l&#39;université du beau petit village de LUCCA et nous avons assisté à un cours sur le tourisme. Mercredi 14 mars, nous nous sommes rendus à VOLTERRA village magnifique dans la montagne. Jeudi 15 mars, nous avons été au lycée pour 8h00, puis les professeurs ont préparé une chasse au trésor dans la ville de PONTEDERA qui nous a conduit au musée PIAGGIO, le musée de la Vespa. La visite a été guidée par mon correspondant Giovanni, on l’a interviewé. L’après -midi à14h00 au lycée nous avons mis par écrit notre ressenti par rapport à la chasse au trésor. Vendredi 16 mars, départ des familles pour se rendre à la gare pour prendre le train jusqu’à Pise où nous avons passé la journée. Nous avons monté les 296 marches de la célèbre tour penchée. J’ai énormément aimé ce voyage car j’ai fait de merveilleuses rencontres, je me rappellerai de Giovanni ainsi que sa famille. Je sens également que j’ai progressé en anglais. Giovanni et sa famille m’ont très bien accueilli et je suis très reconnaissant. J’ai pu goûter aux pâtes italiennes que j’ai aimées. J’ai aussi acheté un porte-clés et un mug comme souvenirs. Pisa, Lucca, Volterra, Firenze, Pontedera, Bolonya, hepsi birbirilerinden güzel ve etkileyici yerlerdi ama benim favorim olarak aklıma yerleşen şehir Volterra idi. Gerek tarihi atmosferi, manzarası ve insanları ile büyüledi beni. Pontedera ise gerek binaları, çevresinin sakinliği ve insanların yaşayış biçimi ile tam emekli olunca yerleşilecek şehir olarak aklımda birinci sırada. Bir hafta gibi kısa bir sürede bu kadar çok arkadaş edinmek ve kaynaşmak dünyanın en güzel deneyimlerinden biriydi. İtalya’nın kendisi ve yaşadıklarım ile birlikte çok özlüyorum. Arkadaşlarım ile en kısa süre içerisinde tekrardan görüşmek dileğiyle. First of all, I would like to thank my teachers for considering me worthy of such an opportunity. This was really the chance of me. Both seeing the urban and rural sights of Italy and making long lasting friendships were priceless. Also, the presentations that were given by the students of the Enrico Fermi Institute were flawless ! They answered the questions and gave interesting facts. Both the students from foreign countries and the students from Italy were noticeably affectionate and resourceful. Moreover, the host family of mine was very courteous. They were always there when I needed something. Furthermore, they have given me more than I asked for. Over and above that, they have given me gifts and moments that I will never ever forget. Plus, they have given me a chance to taste the traditional Italian dishes. Throughout a week, I lived experiences and I made friends that can never sink into oblivion. I am really grateful to being having had such a chance ! Future&quot; has been a unique experience and I am extremely happy to have been part of it. this happy and exciting experience anytime. Είχα την τιμή να με διαλέξουν για να λαβώ μέρος στο πρόγραμμα Erasmus . Έτσι λοιπόν τον Νοέμβριο του 2017 στην συνάντηση του Erasmus στην Κύπρο φιλοξένησα δυαγόρια από την Κον/πόλη. Μια ολόκληρη εβδομάδα γεμάτη δραστηριότητες, εξόδους, συναντήσεις, παιχνίδια, γέλια ,άγχος συγκίνηση. Το πρόγραμμα Erasmus μπορεί να σου προσφέρει αξέχαστες στιγμές με συμμαθητές σου , φίλιες σε όλα τα μέρη και πλάτη του κόσμου, γνωριμία με τον ίδιο σου το τόπο και στην τελική γνωριμία με τον εαυτό σου . Μέσα από το πρόγραμμα έμαθα να διαχειρίζομαι το χρόνο μου να δημιουργώ κάτι που εγώ δεν θα έχω ουσιαστικό όφελος , να συνεργάζομαι με ατμονομά που μέχρι πρότινος ήταν άγνωστα προς εμένα. Η αλήθεια είναι πως στην αρχή δεν πίστευα πως θα μπορούσα να πάρω κάτι από ένα πρόγραμμα και όμως απέκτησα αναμνήσεις που χαράχτηκαν στην μνήμη μου , γνώρισα καλύτερά μέλη του σχολείου μου (μαθητές και καθηγητές), αντιλήφθηκα τι πάει να πει φιλοξενία . 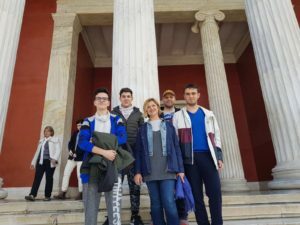 Το Erasmus για εμένα είναι και ήταν μια νέε εμπειρία ζωής . Εμπειρία που θα συνέστηνα σε όλους κάποια στιγμή να δοκιμάσουν . Το για μια εβδομάδα συνοδοιπόροι σου να είναι παιδιά από διάφορες χώρες του κόσμου πέρα από καινούργιες γνωριμίες σε γεμίζει με γνώσεις για τις διαφορετικές κουλτούρες στα ήθη και τα έθιμα και το τρόπο ζωής άλλων χωρών .Αυτές τις εμπειρίες που έζησα δε θα τις άλλαζα με τίποτα και εάν μου δινόταν η εύκαιρα θα το ξαναέκανα με όλες τις χώρες του κόσμου. The Erasmus+ experience has been very exciting for me. Discovering new ways of life and exploring new cultures and places has always been something I’ve been fascinated about, and so it will always remain an unforgettable experience. I have also been able to practice and better my language skills in both English and French. Furthermore, I had the opportunity to visit sights in my country that I have never heard about. 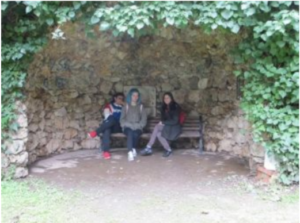 Through the Erasmus+ project I was able to try new things, and I was inspired to travel all around Europe. Additionally, I was able to bond with people from different countries and make friendships that will last for a lifetime! 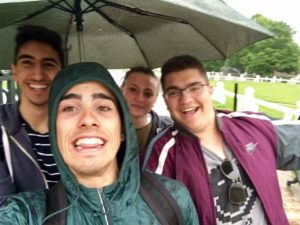 Personally, I feel extremely lucky to have had such a unique experience with the Erasmus+ program. Particularly, it has offered me the chance to learn several new things about other cultures, different civilizations in different countries and other ways of life. In addition, I got to know new places in my country that I have never visited before. Moreover, I learnt more about an important part of the island’s history. The moment that will remain forever in my memory is saying goodbye on the last night of the project. But above all, I am grateful for forming friendships that will last forever! Surprisingly or not, I loved the Erasmus+ mobility to Cyprus. 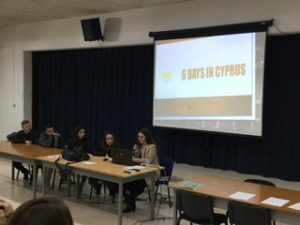 I was thrilled when my school mate, Alin gave me the news that we had been chosen to represent our school in Cyprus, Nicosia at Apostolou Varnava Lyceum, our Cypriot partner school in the Erasmus+ project Foresee the Future. The first thing that struck me, immediately we got off the plane, was the mild weather – I could feel the heat caressing me. The first day at school was full of enthusiasm, everybody was kind and helpful, even the teachers who were not in the project were happy to show us their classroom and spoke a little bit about the subject they taught. Schools in Cyprus are pretty amazing, from the way they look and they are equipped to the way the courses are held and organised, everything is just where it should be! The people of Cyprus are so warmhearted. I am glad that I had the opportunity to meet such human beings and to make real friendships with some of them. The project work was really fruitful: I learnt a lot about Cyprus and its history, about the methods used in the tourism industry to make it work and be beneficial both for the people who work in this economic sector and for the guests who come to this country, to cooperate with students from the partners countries using English to communicate, to present our joint work in a pleasant way, to share moments of joy, to have a time of quality together. I feel so fortunate for the opportunity given to me. Hi there, my name is Noemi Nardini and my school is I.T.C.G. 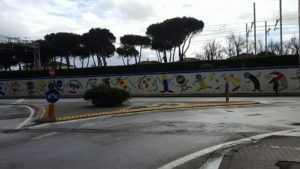 “E.Fermi” in Pontedera, in the province of Pisa (Italy). 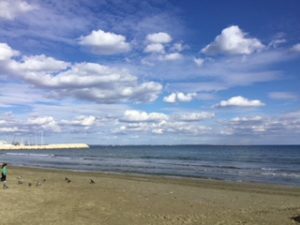 In November 2017 there was the mobility of the Erasmus project “Foresee the Future” which offered me the opportunity to visit Cyprus, an island in the Mediterranean sea. Not so far from Italy. 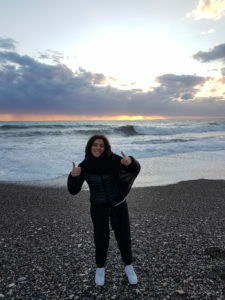 On 19th November we took the train from Florence to Rome and two flights, from Rome to Athens and from Athens to Cyprus; than we got to Larnaca at midnight, where I met my host family for a week. On 20th There was the presentation of the school, some icebreaking activities so we got to know the students from France, Turkey, Romania, Portugal and Cyprus. At 11:00 there was a welcome show with traditional Cypriot dances. After the show we met the authorities in the Strovolos municipality to introduce who we are. On 21th We went to Limassol and we participated in a conference about tourism in Cyprus. Then we went on a guided tour in Limassol where we visited the old town and the marina. At 11:30 we visited Pafos and the archaeological site. 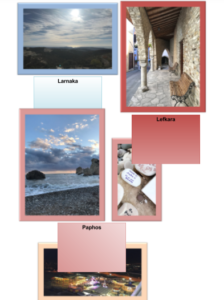 We could see the mosaics in Cyprus and in the afternoon we stopped at “Petra tou Romiou” to visit the birthplace of Aphrodite. The place was so beautiful and we took many pictures. 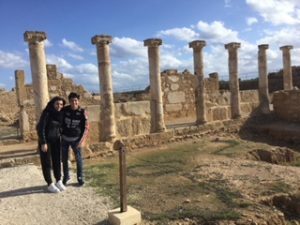 On 22th there were some activities at school, we went to Nicosia, the capital of Cyprus and other important cities on the island. We had some freetime in the city centre, where there are many shops and churches. Then we played a game in groups. 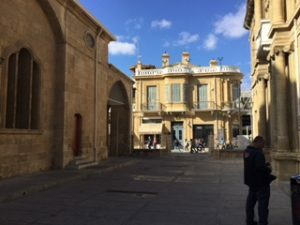 During that we could see the most important landmarks of Nicosia and we learnt a lot of things on Nicosia’s history. On 23th we visited Lefkara village with a tour of a local winery, also we saw the women working Lefkara’ s famous lace, and saw the local silver handicrafts. The winery was very modern and located in a beautiful area and the manager explained us the different steps to produce wine. At 12:00 we went to Larnaca, there were a lot of tourists who were still sunbathing. We visited the castle and then had lunch at a restaurant near the harbor. On 24th during the morning we had group work and we prepared some presentations related to tourism and then we presented them to the others. In the evening we had the farewell dinner at school from the parents association. The parents prepared souvlaki, Greek salad, grilled lamb, potatoes and other local dishes. It was delicious! We had fun dancing together the typical local dances. On 25th we flew back to Italy and we arrived in Pontedera at 11 pm. This experience was very significant because I met new people of different countries and with different cultures. I met true friends and we are still in touch, I’m so glad I was part of the project. My host family was like mine, they welcomed me like a daughter and on the last day they gave me a lot of presents for my family and for me. “família” e apenas à noite nos voltámos a encontrar. As atividades com a escola começaram na segunda. horas à frente de Portugal por causa do fuso horário. um aluno chegar atrasado à escola ou trepa o portão ou leva falta o dia todo. e aproveitarmos a nossa tarde livre. cipriotas que já antes tínhamos recebido em Portugal. mas só vendo para tirar as minhas próprias conclusões. gigante, cheia de luxuosos barcos, e o castelo. a escola parámos na “Petra tou Romiou” o sítio onde a Afrodite nasceu. encontrar para jantar (portugueses e cipriotas). conhecer mais sobre a história da cidade e a sua sociedade multicultural. cidade para a conhecer um bocado melhor. presença desta atividade no Chipre. onde visitámos o seu castelo. basquetebol entre a seleção portuguesa e cipriota (perdemos por pouco). encantador e pessoas sem saber se as voltaria a ver. podemos ganhar por alguém em tão pouco tempo. base nesse perfil tivemos de sugerir uma estadia personalizada no Chipre). cansados, com os nervos à flor da pele e sem vontade de partir para Portugal. On the 18th of November of 2017 , at 8 a.m we all left our houses and went to the airport . I won’t lie and say I wasn’t nervous because I was. Almost nervous enough to want to stay in Portugal. I don’t know why! Maybe the fear of flying or maybe just because I had no clue of what to expect when we would arrive. From Porto to Frankfurt then Vienna and after many hours (too many) we were finally in Larnaca. Tired but happy I might say. Monday was dedicated to icebreaking activities, visiting the school and watching a show with traditional dances. We also met the local authorities and each country presented its school and city. Throughout the next three days we got to: visit the Limassol marina, attend a workshop at the Cyprus University of technology , visit Pafo’s harbor , stop at “Petra tou Romiou”-the birthplace of Aphrodite- ,go on a treasure hunt in Nicosia, visit the Lefkara village and a winery, visit Larnaka and the Saint Lazarus Church. preferences, create the best program possible for them. Later on we attended a farewell dinner at the school and I think, at least for me, that was the moment I realized the week was really over, we were about to leave the people we had gotten so close to. The week in Cyprus wasn’t like I imagined it would be but nothing ever is the way we picture it . We can’t predict how people will act or how things will turn out and that’s probably what makes everything so remarkable . On the other hand there are the people we spent our week with, they were the ones that truly made places and moments special . What’s the point of doing all that if you don’t have someone to share it with? Hi everybody, I’m Manuel Patta and I attend I.T.C.G. “E.Fermi” in Pontedera in Province of Pisa (Italy). 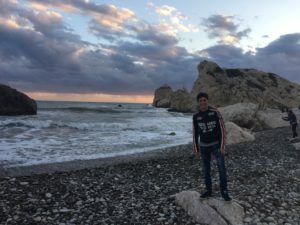 In November 2017 I took part in the mobility of the Erasmus project “Foresee the Future” which allowed me to visit Cyprus, a beautiful island in the Mediterranean sea. 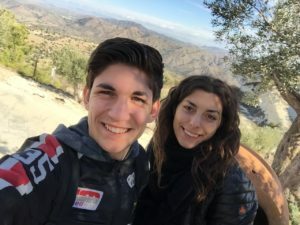 On 19th November after taking two flights, from Rome to Athens and from Athens to Cyprus, we got to Larnaca at midnight and there I met Giannis and his family, that hosted me for a week. On 20th we visited the school, that is divided into separate buildings, where there are many rooms and labs such as the IT lab, the amphitheater, the music room, the play room and the gym. 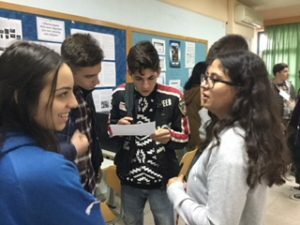 After the visit we did some icebreaking activities so we got to know the students from France, Turkey, Romania, Portugal and Cyprus. At 11:00 we saw a show with traditional Cypriot dances and songs. After the show we went to the Strovolos municipality to introduce our schools and our towns and countries to the local authorities. 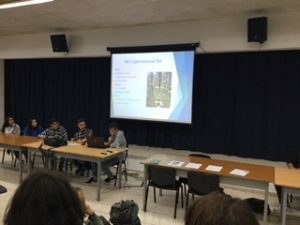 The second day we went to Limassol and we participated in a workshop on tourism at Cyprus University of Technology . 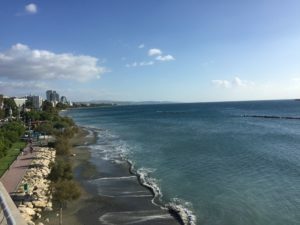 Then we went for a walk in Limassol where we visited the old town and the marina. At 11:30 we left to Pafos to visit the archaeological site. We could admire the most famous mosaics in Cyprus and in the afternoon we stopped at “Petra tou Romiou” to visit the birthplace of Aphrodite. The place was so beautiful and breathtaking that we took many pictures. 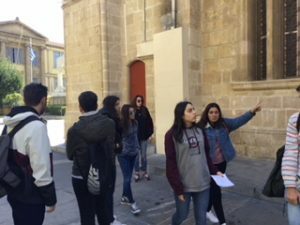 On 22th after doing some activities at school, we went to Nicosia, the capital of Cyprus and the most important city on the island. We had a walk in the city centre, where there are many shops and churches. Then we played a treasure hunt, in groups. 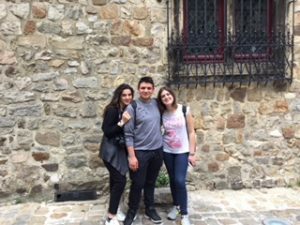 While we were playing, we saw the most important landmarks of Nicosia and we learnt a lot of things on Nicosia’s history, the divided city and the traditional and present-day occupations. The next day we visited Lefkara village with a tour of a local winery. I must say that it was very interesting to see some local ladies who were making Lefkara’s famous lace, and see the local silver handicrafts, displayed in the shop windows. The winery was very modern and located in a beautiful area and the manager explained to us the different steps to produce wine and showed us their cellar. At 12:00 we went to Larnaca which is a seaside resort, with a lot of tourists who were still sunbathing. We visited the castle and then had lunch at a restaurant by the sea. On the last day we went to school and we prepared some presentations related to tourism and then we presented them in the amphitheater. 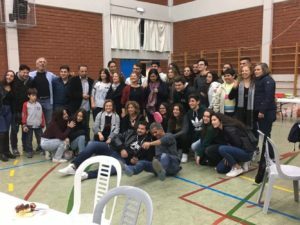 In the evening we had the farewell dinner at school with the teachers, the students and the host families involved in the Erasmus project. The parents prepared souvlakia, Greek salad, grilled mushrooms and other local dishes. It was delicious! Besides we had fun dancing together the typical local dances. On Sunday 25th we left for Italy and we arrived in Pontedera at 10:30 pm. This experience was amazing I met new people of different countries with different cultures. I hope, one day, I will meet all the good people I met during this Erasmus mobility again. Thank you for this wonderful experience that has opened my horizon, my mind and my heart! I will never forget my host family’s generosity and wonderful hospitality… I will never forget the time spent with my new European friends! Le voyage en Chypre était vraiment très intéressant et très enrichissant. On a pu apprendre de nouvelles choses, de nouvelles cultures et même quelques mots en grec, italien, roumain et portugais. On a également pu améliorer notre anglais. Nous sommes partis d’Alençon à minuit direction Paris, à l’aéroport Charles de Gaulle, afin de prendre un premier avion pour Vienne en Autriche et un deuxième pour Larnaca. Nous sommes arrivés à Chypre vers 15 heures puis nous sommes aller à Nicosie où nous avons rejoints nos correspondants. Ma correspondante s’appelle Emily. Nous sommes rentrés chez elle et après 2 heures de repos, ses parents m’ont fait visiter le centre ville de Nicosie. Le premier jour, nous sommes restés au lycée, où nous avons fait quelques jeux afin d’apprendre à nous connaître. Nous avons visité le lycée, écouté une chorale chanter et vu des danses folkloriques chypriotes. L’après-midi, nous avons eu quartier libre. Avec Emily, nous avons rejoint une de ses amie et nous sommes allé au centre commercial. Le soir, nous avons rejoint quelque correspondants dans un café. 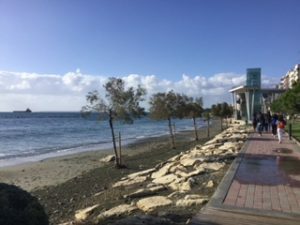 Le deuxième jour, nous sommes allés à Limassol, dans l’université TEPAK, nous avons également visiter le port et la Marina. 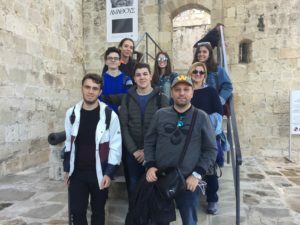 Nous sommes ensuite partis à Pafos’ Harbor où nous avons visité les mosaïques et le château. Au retour, nous nous sommes arrêtés à Petra tou Romiou, sur le lieu où est née Aphrodite, où nous avons pu prendre des photos. Le soir, avec la famille d’Emily, nous sommes allés voir le match de coupe d’Europe : Real Madrid contre l’équipe de Nicosie. Le troisième jour, les élèves chypriotes nous ont présentés la ville de Nicosie avant de nous faire participer à une chasse aux trésors par équipe. Nous avons eu, ensuite, un temps libre pour faire les magasins, acheter des souvenirs avant de rejoindre le bus à 13 h 30. L’après-midi, nous n’avons rien fait de spécial mais le soir, nous sommes tous allés au bowling, et à Mc Donald’s. 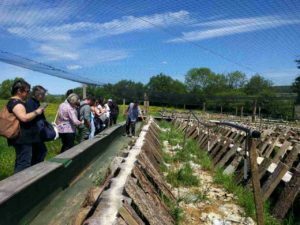 Le quatrième jour, nous sommes allés à Lefkara, nous avons visiter une cave de vin, un lycée et nous avons un temps libre pour visiter le village de Lefkara. L’après-midi nous sommes aller à Larnaca, où nous avons eu un temps pour manger. Le soir, avec quelques correspondants, nous avons mangé dans une pizzeria et nous avons rejoint tous les correspondants dans un café. 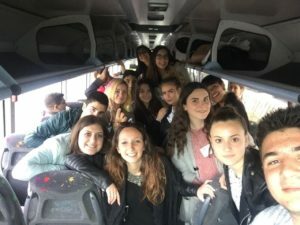 Le cinquième jour, nous sommes restés toute la matinée au lycée, par équipe nous devions créer un programme pour une famille pour un voyage en Chypre et nous l’avons présenté aux autres élèves. L’après-midi, nous sommes allés avec quelques correspondants au centre commercial. Le soir, un repas de départ a été préparé par les parents des élèves chypriotes. Après ce repas, nous sommes allés dans une fête foraine. Nous sommes partis vers 3heures pour Larnaca, avec les Portugais pour prendre l’avion pour Vienne. Nous avons eu une escale de 4 heures à Vienne avant de prendre un autre avion pour Paris, nous sommes arrivés vers 19h30 à Alençon. Je tiens à remercier ma correspondante, sa famille, les professeurs et élèves qui ont participé au projet ainsi que l’agence ERASMUS qui m’a permis de vivre des moments inoubliables dans un pays magnifique. We left Alençon at midnight direction Paris, then we went to the CDG airport . We took off from Paris for Vienna in Austria and we took the second plane for Larnaka. We arrived at 3pm and we took a minibus to Nicosia, where we found our correspondents. I found my correspondent Emily, we visited the city centre of Nicosia. 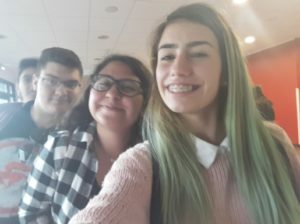 We stayed at their high school where we played some icebreakers games .Pupils showed us the school, the school choir sang songs in Greek and we admired the traditional dances At the end of their lessons at 1:30 pm we we were free, with Emily and a friend we went to the shopping mall. In the evening we joined the others in the coffee shop, Grind caffe. We visited the Marina the port of Limassol as well as the castle. 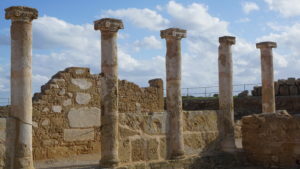 We went to Paphos Harbor where we saw mosaics and a castle. We had time to eat in a small restaurant. We left to Petra tou Romiou, the place where Aphrodite was born, to take photos then we left for Nicosia. In the evening with Emily and her family we went to see the match of Real Madrid against the team of Nicosia. 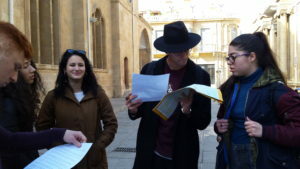 The Cypriot pupils organised a treasure hunt in the city. At the end of the game we had free time for buying souvenirs. We returned to the bus at 1:30pm. In the afternoon we did nothing special but in the evening we all went to the bowling alley. It was a really good evening and very funny. We went to a village, Lefkara to see a vineyard and its cellar Later we went to Larnaka where we saw the castle and ate. We returned to the high school at 6:30 pm. In the evening we ate in a pizzeria and we joined the others in a coffee shop. On Saturday morning, very early at 3am we left with the Portuguese teachers and pupils. Thank you very much indeed Erasmus +, it was a fantastic experience !!! Nous sommes arrivés le dimanche 19 novembre 2017 à l’aéroport de Larnaka à 15h. Ma famille est venue me chercher, Loukia et sa maman. Nous avons roulé pendant 10 minutes avant d’arriver chez elle. Ce sont des gens très gentils, qui dès mon arrivée m’ont mis à l’aise. J’ai découvert ma chambre puis je me suis installée. Le dimanche soir avec Loukia et sa petite sœur, nous sommes allés dans Nicosie et elle m’a fait découvrir sa ville. Lundi 20 novembre : Nous sommes arrivés au lycée à 7h30 car là-bas les cours commencent tôt !. Avec nous dans l’amphithéâtre il y avait des élèves roumains, italiens, turcs, portugais et chypriotes. Nous avons commencé par un jeu afin de nous connaître. 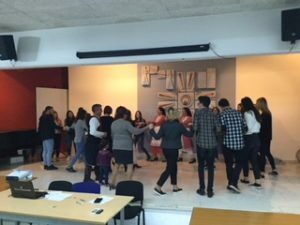 Par la suite, une démonstration de danses traditionnelles a été faite puis nous avons été invités à danser avec eux. A 13h30, les cours se terminent et chacun est rentré dans sa famille respective. L’après-midi, ma correspondante avait un cours particulier de 14h30 à 18h et je suis restée chez elle pour me reposer. Mardi 21 novembre : Nous avons pris le bus en direction de Limassol, où une femme tétraplégique nous a expliqué les différents moyens qui sont déployés pour profiter de la mer. 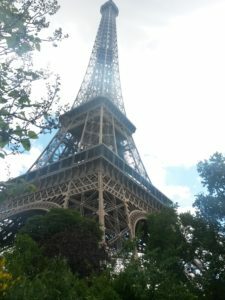 Par la suite nous sommes allés à l’université pour assister à un cours sur le tourisme. 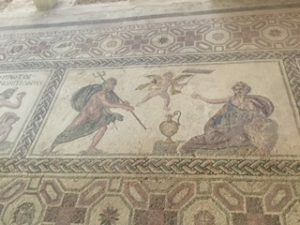 L’après-midi nous sommes allés à Paphos où nous avons visité les mosaïques et le château. Mercredi 22 novembre : Nous sommes allés à la mairie pour que des élèves nous présentent leur ville. C’est Antoine qui a présenté notre ville et notre lycée. Après cela, nous avons été divisé en 3 équipes pour faire une chasse au trésor, j’étais dans l’équipe 3 et c’est l’équipe 1 qui a gagné. 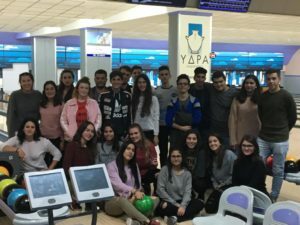 Le soir une sortie bowling était prévue pour tout le groupe Erasmus. C’était vraiment amusant et cela nous a permis de plus nous rapprocher les uns des autres. Après le bowling nous sommes allés au fast-food et nous avons bien rigolé. 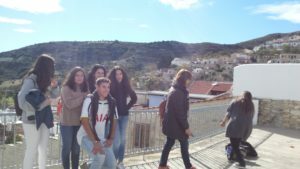 Jeudi 23 novembre : Nous avons visité une cave à Lefkara un village traditionnel, il faisait super beau. Ensuite nous avons effectué une visite dans un lycée puis Océane, Antoine et moi avons interviewé une lycéenne sur son village. Le soir on est sorti dans un café ou nous nous sommes retrouvés tous ensemble. Vendredi 24 novembre : Un travail de groupe nous a été demandé : nous devions créer un programme pour une touriste. On a présenté notre travail devant les professeurs dans l’amphithéâtre. Nous sommes rentrés dans nos familles puis l’après-midi retrouvailles au centre commercial pour faire du shopping, en plus un jour de Black Friday ! Le soir un repas au lycée préparé par des parents nous attendait, tout le monde était présent, nous avons passé un bon moment. A la fin du repas nous sommes tous partis en direction de la fête foraine où on a fait de la grande roue. C’était cool et on a pu profiter ensemble de notre dernière soirée. Cette expérience m’a énormément plu. J’ai découvert à travers ce voyage des personnes humaines, toujours à vouloir que l’on soit bien et qu’on se sente chez soi. J’ai découvert un autre mode de vie que le nôtre. C’est une expérience enrichissante que j’ai beaucoup aimée. Je remercie Loukia pour son hospitalité,ses parents pour leur hospitalité, sa grand-mère pour ses bons petits plats le midi ainsi que sa petite sœur pour sa joie de vivre. Je remercie également les professeurs du lycée Madame TOTH SOLIGNAC, Madame PARPAILLON ainsi que Madame WHEELER avec qui j’ai pu partager de bons moments. My last thank is for the Erasmus + programme that allowed me to have a great time !! Nous avons atterri le dimanche 19 novembre 2017 à l’aéroport de Larnaka après plus de 5 heures de vol et une escale à Vienne en Autriche. A notre arrivée au point de rendez-vous avec les familles, mon correspondant Giorgos Aristodemou et son père était déjà présents, ils ont gentiment chargé mes bagages dans la voiture et m’ont conduit à leur domicile, là où j’allais passer une semaine fabuleuse. La maman de Giorgos, nommée Maria, a souhaité que je passe une semaine parfaite sous son toit et dans son pays. La journée s’est conclue par un repas traditionnel en famille auquel étaient présents Giannis, le meilleur ami de Giorgos, sa sœur accompagnée de son mari et de leur enfant. Lundi 20 novembre, nous nous sommes rendus au lycée où les cours commencent à 7h30. 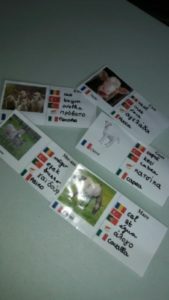 Nous avons entamé la journée par un jeu afin d’apprendre à tous nous connaître. Nous avons aussi eu droit à une démonstration de danses traditionnelles chypriotes. La matinée passée et les cours se terminant à 13h30, nous sommes rentrés au domicile où je me suis reposé tout l’après-midi. Mardi 21 novembre, tout le monde est monté à bord d’ un bus en direction de Limassol. En bord de mer, nous avons eu une information sur l’accueil et l’aide apportée aux personnes handicapées afin qu’elles puissent profiter de cet espace grâce aux moyens à disposition, comme un fauteuil roulant spécialement conçu pour aller dans l’eau ou un vélo dont les pédales sont actionnées par les mains. Nous nous sommes ensuite rendus à l’Université Technologique pour suivre un cours sur le tourisme chypriote, européen et mondial. Nous avons terminé cette matinée par la visite de la Marina de la ville. L’après-midi, nous nous sommes rendus à Paphos, capitale européenne de la culture 2017 où nous avons visité le port, les mosaïques et le château. 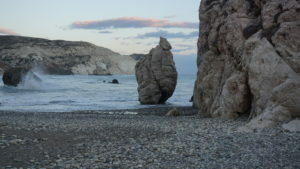 Lors de notre retour, nous nous sommes arrêtés à « Petra tou Romiou », là où Aphrodite, déesse de l’amour dans la mythologie grecque, est née afin de prendre des photos. Le soir, je me suis rendu avec Giorgos dans un café où nous avions rendez-vous avec d’autres élèves afin de regarder le match opposant l’Apoel Nicosie au Real Madrid en Ligue des Champions. 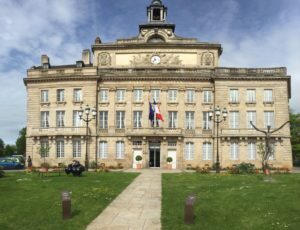 Mercredi 22 novembre, tout le monde s’est réuni à la mairie de Nicosie afin d’assister à la présentation de tous les pays participants et de chaque lycée par un élève de chaque pays en présence du maire de la ville, cela fut moi pour la France. Après cela, nous avons tous participé à une chasse au trésor dans la ville de Nicosie, nous étions divisés en trois équipes, je faisais partie de la première, nous avons bien sûr remporté ce jeu ! Le soir, nous nous sommes tous retrouvés au bowling, ce fut un très bon moment. Nous sommes ensuite allés manger dans un fast food, des liens vraiment solides ont commencé à se lier entre tous les participants du projet durant cette journée. Jeudi 23 novembre, nous avons visité une cave à vin près de Lefkara avant de nous rendre dans ce village et de nous balader dans les rues. Nous avons eu la chance de pouvoir visiter une magnifique église et de profiter d’un grand soleil. Nous avons également visité un lycée. Lors de cette visite, nous avons posé des questions sur le village aux élèves de ce lycée. 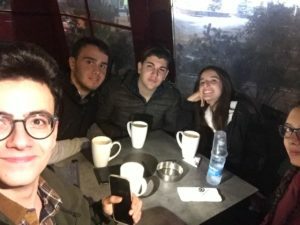 Le soir, nous nous sommes tous retrouvés dans un café afin de passer une nouvelle fois un bon moment ensemble et de créer de nouvelles affinités avec d’autres personnes. 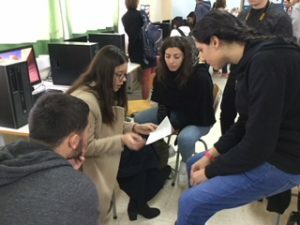 Vendredi 24 novembre, dernière journée au lycée, nous avons travaillé par groupe dans le but d’établir un programme pour 6 jours de vacances à Chypre. Nous avons ensuite présenté notre travail devant les élèves et les professeurs. Cette matinée prit fin par la remise des prix aux vainqueurs de la chasse au trésor ainsi qu’un cadeau pour tout le monde. L’après-midi, nous nous sommes retrouvés au centre commercial « The Mall » afin d’effectuer quelques achats. Le soir, un repas a été organisé avec tous les participants, les professeurs et les parents. 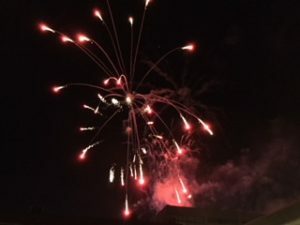 Puis nous nous sommes rendus à la fête foraine située près du lycée où nous avons fait la grande roue, ce moment et le repas étaient encore des moments très agréables et très drôles que je n’oublierai jamais. J’ai énormément aimé ce voyage car j’ai fait de merveilleuses rencontres, notamment Giorgos qui est quelqu’un d’exceptionnel, ainsi que sa famille. J’ai découvert une nouvelle culture et un nouveau mode de vie que j’apprécie tout particulièrement. Ce séjour m’a aussi permis de prendre pour la première fois l’avion et de faire la grande roue pour la première fois aussi. Je sens également que j’ai progressé humainement, car j’ai vécu durant une semaine dans une famille que je ne connaissais pas et qui ne parlait pas la même langue que moi. Giorgos est m’a parfaitement accueilli, nous avons parlé de tout et de rien, je lui ai fait découvrir des chansons françaises qu’il a appréciées. C’est quelqu’un qui a le cœur sur la main et que je suis prêt à accueillir dès qu’il le souhaite en France. Cette semaine était je pense, la meilleure de ma vie, tous les moments passés sont à jamais gravés dans ma mémoire. 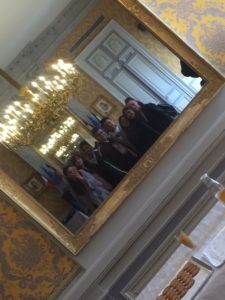 Je remercie tous les participants élèves et professeurs de ce projet, la famille de Giorgos, Mme Toth-Solignac, Mme Parpaillon et Mme Wheeler pour cette fabuleuse semaine. Merci également au programme ERAMUS + qui a financé ce projet. I spent a marvelous week in Cyprus. I stayed with Giorgios and his familly. They are very friendly and organised everything for me. I discovered a new country and a new culture. We visited Nicosia, Limassol, Paphos, Larnaka and Lefkara. The landscapes were wonderful and all the cypriot people were very nice and friendly. I will remember this week for a long time ! 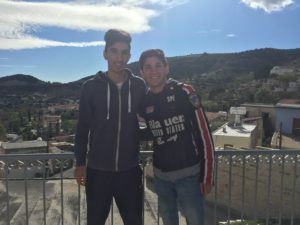 : I met friends from different countries, I took the plane for the first time and I will never forget my friend Giorgios. – and my friend Giorgios and his family. Kıbrıstaki ilk günüm çok ilginçti. İlk defa tanımadığım bir ailenin evinde kalacaktım ve heyecanlıydım. Argyro ve babası bizi karşılamaya geldi. Evlerine gittiğimde annesi ve köpekleri ile tanıştık. Bütün hafta boyunca okula gittik. Sürekli aktiftik. Gerek geziler gerekse diğer aktiviteler bizi eğlendirdi. Gittiğimiz yerler oldukça etkileyiciydi. Diğer arkadaşlarda gayet samimi ve sosyal insanlardı. Öğle yemeklerinde ve okul sonrasında onlarla güzel vakit geçirdik. Kıbrıs bize yeni arkadaşlar ve güzel anılar kazandırdı. My name is Atakan and I’m going to give information about Cyprus Mobility. Firstly,Cyprus was wonderful for me. My host family was Maria Emmelia Charalambous and her family. They welcomed me very nicely. They helped me in every way. 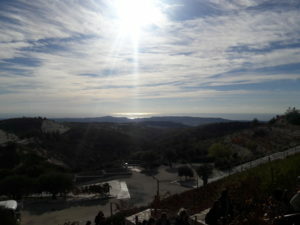 In the mornings, we went to special places of Cyprus with other students and teachers. We ate lunch with other students and we chatted with other students everyday. 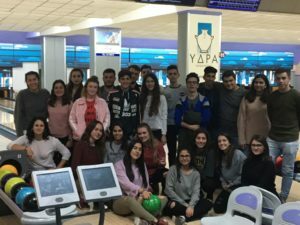 In the evenings, we went to the cinema and cafeteria and we played bowling with other students. As a result, Cyprus was a nice experience for me. I learned something about other cultures. I had a lot fun in Cyprus. 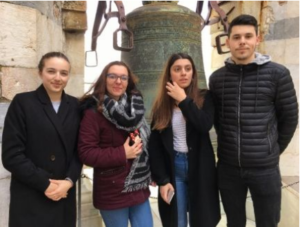 The trip from France, Alençon, within the “Erasmus+” project had a strong positive effect on me through the natural beauty of the area, the complex tourist objectives, but especially by the inhabitants of this city, Alençon, and their lifestyle and traditions. For one week I managed to get to know some of them and live in French style. I also had the opportunity to travel by airplane. Although the French language is unknown to me, I enjoyed a delightful atmosphere with the host family who offered me the best accommodation, the most beautiful and exciting moments with them, feeling like a member of their family. 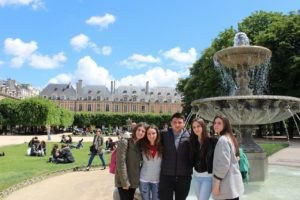 I have also made many friends with both the “Maréchal Leclerc” High School students in Alençon and the students involved in the “Erasmus+” project from different countries with whom I have been able to communicate in English with ease and with whom I have been in touch since the end of the trip. I also created new friendships, close friendships with certain French high school students, including some “sun burnt” girls and boys (my favourite students!!!! ), with whom I spent wonderful, unforgettable moments that I will never forget. I was pleasantly impressed by the facilities of the French partner school. It has spacious classrooms, very clean and well equipment in accordance with the student’s specialization. I also noticed a friendship relationship between students and teachers – students respect and embrace most of the teachers. The students have a lot of freedom in school – they are not forced to wear a uniform and they have a special space for smoking. This way they become more responsible for their deeds. Although they have more freedom (which we will never meet in Romania, in the high school where I study and not only), they are more respectful and educated. 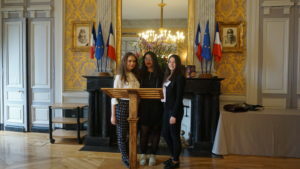 The French high school teachers organized various activities during the 5 days spent together. At the end of the activities, we had free time we could spend either with the host family or the students involved in the project or with our friends. My mate Mălina and I promoted our country, Romania, delivering a presentation in English. We showed the students and teachers from the partner countries the beauties of our country and invited them to visit it. Near the school there is a big canteen where students can have lunch together and where they have consistent and fresh meals, diverse dishes and very well cooked food, to everyone’s taste, in return for a ticket bought before in advance. I had lunch there several times and I can say that the food was delicious. What I liked most in the visited cities is the very rich and valued nature that perfectly matches the city’s atmosphere. Thanks to my hosts (a family of motorcyclists) I had the opportunity to fulfill my dream: I was taken to the well-known motorcycle race circuit in Le Mans where the MotoGp race was taking place so I saw the motorcycles of the participating pilots and even some of the pilots. Another factor that makes me want to spend more time in Alençon, besides my friends, is the French lifestyle. People are more relaxed, they have a good life and they always feel at ease, no matter where they are. In conclusion, I can say that this project mobility has been the most exciting and interesting experience of mine so far, due to the beautiful moments spent with the people close to me, whom now I miss so much, especially an important person met on the last days and with whom I couldn’t spend as much time as I wished but the short moments will always stay engraved in my heart. This experience was, at the same time, a great challenge for me, but I am the WINNER! This Erasmus+ mobility has been one of the most beautiful experiences in my life. First of all, it was my first flight and it was incredible! I liked it so much and I am looking forward to having another opportunity to travel by plane. I also liked the atmosphere in the airport and even the fact that I had to “check in” – a very boring thing for those who fly regularly! I can say that they are right. You must see it with your own eyes! 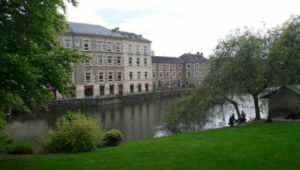 I was surprised about how the city of Alençon looked like. The city – full of history – was so clean and peaceful. In the school I visited I met a lot of friendly, very sociable and responsible students. They clean the school by themselves and this activity is not considered a punishment; it is considered a normal activity. The people’s mentality is also amazing. There are a lot of students from the ex-French colonies but for the students who study at that school racist attitudes are unknown. This learning activity offered me the possibility to live in another family – a very lovely family where communication was very important. From the first day of my visit they made me feel at home. They took good care of me and paid attention to all the details in order to make me experience how it is to live comfortably in a foreign country and being surrounded by foreign people. 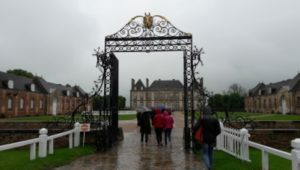 Consequently, I did not feel as a guest but as a member of the Chesnay family. I noticed that the French eat much although they are fit. They eat a lot of vegetables and salad is always the first. It is very healthy! The dessert contains of cheese and, after this, yogurt or cake may easily come. Another pleasant experience was the communication with people with disabilities. A pretty lady taught us some specific signs useful in the communication with unspeaking people. I was really impressed by the way French people live their everyday life. There is no emphasis on the clothes you wear or the house you live in. The most important thing is that they work. Everybody works! The place does not matter – a furniture factory, a snail farm or even a park. They are proud of themselves, of their work and life and accept that not everyone can work in an office and wear smart clothes while working. 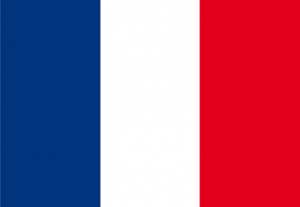 In the end, I can say that France is my favorite country and I really want to go back to Alençon to meet my new friends and to visit the places I did not have time to visit during my short stay there. 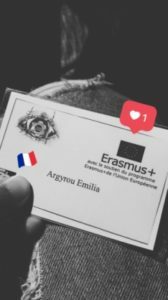 Je m’appelle Gaia Cecchi, je frequente l’Institut Fermi à Pontedera, et cette année grâce à mon école j’ai eu l’opportunité de participer au projet Erasmus Plus “Foresee the future” qui a eu lieu dans la ville de Alençon, au nord de la France. Le matin du 14 mai 2017 nous avons quitté l’aéroport de Pise et après une heure et demie nous sommes arrivés à l’aéroport de Paris Beauvais où un bus nous a emmenés à Alençon en Normandie. À Alençon, nous avons été accueillis par les familles et j’ai rencontré le directeur de l’école qui a participé au projet, avec sa femme qui m’ont accueilli dans leur maison pendant toute la semaine. Dans l’après-midi, pour mieux nous connaître nous avons fait une promenade dans la ville et nous avons préparé un dessert que nous avons mangé pour le dîner. Le lendemain nous avons visité l’école française, elle était très grande et divisée en deux bâtiments, l’un où il y avait tous les laboratoires, comme le laboratoire de technique, le laboratoire médical et le laboratoire de mécanique, en plus il y avait quelques classes et un petit magasin de produits typiques français. 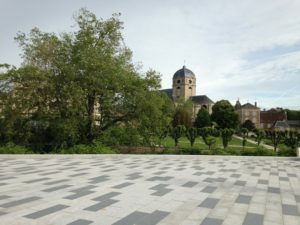 Dans l’autre bâtiment, il y avait la cantine, le logement où logeaient les garçons et les filles qui vivaient loin, le théâtre et d’autres classes. À l’école, nous avons fait beaucoup d’activités amusantes avec les autres élèves pour mieux se connaître. 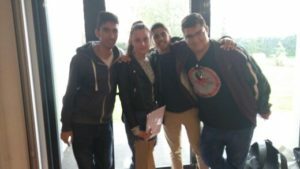 Nous avons rencontré des étudiants: Français, Portugais, Chypriotes, Roumains et Turcs et grâce à ces activités nous avons eu l’opportunité de mieux nous connaître et de nous faire de nouveaux amis. Nous avons visité une fromagerie typique française, et enfin nous avons visité une écurie où le lait de cheval est transformé en produits cosmétiques. Cette expérience a été unique, je remercie mon école de m’avoir donné l’opportunité de rencontrer beaucoup de gens, avec de cultures et d’intérêts différents et de visiter de nouveaux endroits. J’espère avoir l’occasion à l’avenir de participer à un projet comme celui-ci. Everything started on Sunday… At midnight, we took the shuttle bus from Nicosia to Larnaca airport. We were so excited because we had been preparing for this trip for months, and it was finally happening! I had never been abroad so I was over-enthusiastic. Our flight was scheduled for 3:40 in the morning, so there was almost nobody around, but we didn’t really care. We spent some time at the stores, eating and discussing about the Eurovision final. We left from Cyprus and arrived at Frankfurt. It was my first trip with an airplane and I was amazed by the view from up there! We stayed at Frankfurt airport for about two hours, which were spent with some more stores and food, and then we left for Paris. George and I were thrilled because it was our first time in France, and it was finally time for us to speak French! Then we took the train to Le Mans, and after spending a few hours there we took another train to Alençon. After 19 hours of travelling we had finally made it to our final destination! We were very tired but also very excited, since it would be the first time meeting our hosts. Mrs Géraldine, the teacher that would be hosting me, was very kind. The view from my room was awesome and the whole family was just lovely. At that point I was very tired, so I had a shower, dinner and went to sleep. On Monday morning everybody was at the school. We would have a tour of the school with Alexe, a French student. I can still remember how relieved she was when we told her we spoke French. We were constantly comparing the Maréchal Leclerc Lyceum with our school and spotted their differences or similarities. After that we were divided into two groups. My group would go on a guided tour of the town. 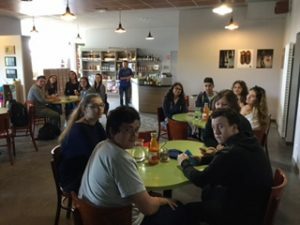 We explored many of the important parts of Alençon, and then we had lunch at the school canteen with the French students. I have to say I liked the food very much, and was surprised that it was divided into so many courses. Next, we went to the lace museum, and afterwards we explored other parts of the city with a deaf person as a guide. We learnt lots of things about Alençon and the life of a deaf person, and she even taught us a few words in sign language. In the end I was very tired because of all the walking we did on the two tours. At night, I tried Camembert, one of the most famous French cheeses, for the first time. It was certainly very different from the cheese we have in Cyprus, but it wasn’t bad. 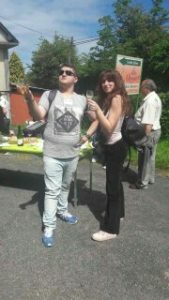 On Tuesday, we went to an apple farm, to learn about the process of making cider, which Normandie is very famous for. For lunch we had a big burger with fries and lots of cheese since we were in France. After the burger we were offered Camembert. This time though, it was much stronger, so it was a bit weird for me. There, Emily and I met two students from Turkey, Zümra and Alara. We talked about the similarities between Cyprus and Turkey and our experiences in France. After that, we visited a snail farm. It was something we had never seen before. That night I went with my host family to a French restaurant, and it was wonderful. 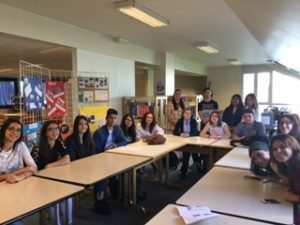 On Wednesday, French students had prepared a presentation about French food habits, and we also learnt about the eating habits in all of the countries that were participating in the Erasmus project. Then another group of French students demonstrated first aids in case someone was hurt and what we should do. It was fun because whoever wanted could try it. Since our activities had ended early, we went to Le Mans. We visited the old part of the city and it was beautiful. We took photos of literally everything there, since it was very scenic. While returning back to the car, it was raining a lot, so we had to run for a bit, but it was definitely worth it. 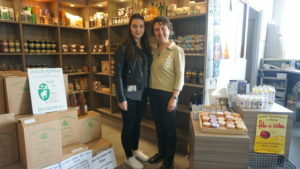 For dinner, we had pizza with Murielle and her family, and Evelina, a student from Cyprus who was staying with Murielle. On Thursday, it was finally raining! It was funny because everybody talked about how it’s always raining in Normandy, but for the 4 days we had been there we hadn’t seen any rain. At first we went to the outdoor market in Alençon, and then at the Green way. After having lunch in the area, we visited the Haras du Pin, a very old stud farm in Normandy. There we also saw the traditional way of making horse shoes. It seemed to be a very difficult and long process. On Thursday, at noon, I met Sara and Diogo. My friend George had already met them because they were in his group. Of course it was still raining, but none of us had brought an umbrella except for Sara. We all had to squeeze under the umbrella to stay dry, and at that day the ‘umbrella crew’ was born! George, Sara, Diogo and I, became good friends and we still keep in touch. At night, all the teachers came to Mrs Géraldine’s house, and there were lots of French specialties. By Friday, we all knew each other, and had spent time together. But sadly, it was our last day together. 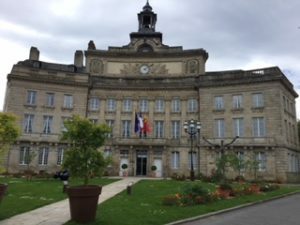 Our last day in Alençon… In the morning we made a video where we said useful phrases in our native languages, and then we visited the mayor of Alençon. George and I had an interview there for a local newspaper about the Erasmus program in Alençon. Then, the students from Turkey and Romania had a presentation about their countries, and we had lunch at the canteen together. We were very close with the Italians, and they taught us Italian words, while they tried to pronounce Greek words, especially with the Cypriot accent. Afterwards, we had a quiz about France, and then a speed dating game with the Erasmus and French students, which I liked very much because it was interesting seeing different people’s views on travelling. Our last activity in France was a get-together with snacks from Normandy and the countries participating in the Erasmus. We were so happy we were together, but also sad because we knew it would be our last day there. On Saturday morning we had to take the train. From Alençon we went to Le Mans, and then to Paris. We got on a hop on hop off bus and saw most of the monuments of the city. It was perfect, but then, we had to hurry so we could get the shuttle bus in order to go to the airport. It wasn’t hard to find things to do in the airport. Then we finally arrived in Cyprus. It was a bit of a shock because we had an exam in two days. I still have so many memories from the trip. From the first days, trying to pronounce people’s names, to the last day when we had to say goodbye… We still try and keep in touch though, so at least there’s that. 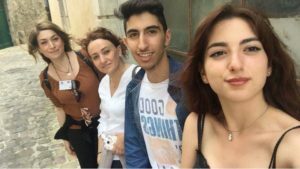 I would encourage everyone who has the chance to participate in a program like the Erasmus project to do so, because of all of the experiences I had during that trip. 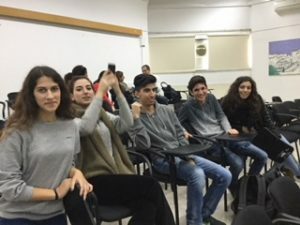 Now the only thing I can do is to look forward to November, when students from France, Italy, Portugal, Turkey, and Romania will come to Cyprus for the Erasmus project. We did first aid at school today. It was very interesting. I did some CPR on someone. Unfortunately we lost him. In the afternoon I went to Alençon with Alexis and his brother Dimitri for a walk. It was very nice. Overall it was a very relaxing day. On this day, we visited a primary school in a small village called Hauterive. The kids in the school were all amazing. They were all really nice and hard working, trying their best to give us a tour in English. They were so adorable that I didn’t want to leave. Afterwards we visited the Haras du Pin stud. We saw some cool carts and horses, there was only one problem. It was raining! Really hard too! We didn’t have an umbrella but thankfully an Italian girl, Sara, was kind enough to share her umbrella with us. Giannis, Sara, Diogo from Portugal, and I shared the same umbrella for most of the day. We talked and talked, and quickly became good friends. Thus, the Umbrella Crew was born! Πρώτη μέρα στην Alençon, νιώθω τόσο όμορφα και ήρεμα. Σήμερα πήγαμε βόλτα στην πόλη για να την γνωρίσουμε. Το μόνο που έχω να πω είναι ότι δεν έχω δει ποτέ στη ζωή μου τόσο όμορφα κτήρια! (Photo 1) Ειδικά όταν αντίκρισα τον γοτθικό καθεδρικό ναό με έπιασε δέος. Είχα μείνει άφωνη… Το απόγευμα επισκεφθήκαμε το μουσείο δαντέλας, για την οποία είναι φημισμένη η πόλη. Τα πραγματάκια που είδαμε ήταν πραγματικά αριστουργήματα! Θυμάμαι πριν φύγω μου είπε η μαμά να της φέρω ένα μικρό κομματάκι δαντέλας για ενθύμιο. Η αλήθεια είναι ότι για να αγοράσω ένα τέτοιο μικρό κομματάκι θα έπρεπε να παρατήσω το σχολείο και να γίνω αγρότισσα για κανένα χρόνο! Πράγματι όμως ήταν τέτοια κομψοτεχνήματα που άξιζαν μια περιουσία. (Photo 2) Ύστερα από αυτή την εξουθενωτική μέρα γυρίσαμε σπίτι. Πραγματικά δεν θα μπορούσα να έχω καλύτερη οικογένεια. Παίξαμε επιτραπέζια παιχνίδια, φάγαμε και έτσι πέρασε ένα ακόμα βράδυ. Σήμερα το πρόγραμμα έχει Camembert, cider και φάρμα με άλογα. Για να πω την αλήθεια είμαι λίγο παραπάνω ενθουσιασμένη με τα άλογα. Αρχικά πήγαμε εκεί που παρασκευάζεται το Camembert. Έχω να πω ότι ήταν από τα καλύτερα τυριά που έχω φάει ποτέ στη ζωή μου, και δεν έχω δοκιμάσει και λίγα, μιας και είμαι λάτρης των τυριών. Αυτή η γεύση όπως και η μυρωδιά θα μου μείνουν αξέχαστα! (Photo 3) Ύστερα πήγαμε σε ένα κτήμα όπου παρασκευάζεται βιολογικό cider. Η ιδιοκτήτρια μας έκανε μια ξενάγηση στον χώρο και τα μηχανήματα και έπειτα μας κέρασε αυτό το δροσιστικό ποτό συνοδευόμενο από σνακ και φαγητά! Ήταν πολύ όμορφα και υπήρχε ένα πολύ αρμονικό κλίμα μεταξύ μας… (Photo 4) Ακολούθως αναχωρήσαμε για τη φάρμα με τα άλογα! Η πιο όμορφη στιγμή της ημέρας για μένα! Λόγω του ότι λατρεύω τα άλογα, χάρηκα πολύ που είχα την ευκαιρία να με ξεναγήσουν εκεί και να δοκιμάσω και γάλα αλόγου. (Photo 5 ) Παρόλο που ήταν μια κουραστική μέρα πέρασα πολύ όμορφα και αυτές τις εμπειρίες που έζησα θα τις κουβαλάω μαζί μου για μια ζωή! Η μέρα μας σήμερα θα είναι πολύ χαλαρή και ξεκούραστη. Τελευταία μέρα, όπως έγραψα, σήμερα. Τελικά όταν περνάς όμορφα και ευχάριστα ο χρόνος κυλάει σαν ποτάμι… Ξύπνησα σήμερα το πρωί περίεργα, μη μπορώντας να αρθρώσω λέξη. Φτάνοντας στο σχολείο συνειδητοποίησα ότι ήταν η τελευταία φορά που το αντίκριζα όπως επίσης και τα πρόσωπά του. Ήταν δύσκολο μπορώ να πω… (Photo 11) Πρώτα πήγαμε στο δημαρχείο και γνωρίσαμε τον δήμαρχο. Πολύ ευγενικός άνθρωπος και μας έκανε και αναμνηστικά δωράκια για να θυμόμαστε την Alençon. Ήταν συγκινητικό. (Photo 12) Μετά από αυτή τη συνάντηση μείναμε λίγο στο κέντρο της πόλης για να αγοράσουμε δωράκια αν θέλαμε. Δεν κάτσαμε πολύ και πιστεύω δεν χρειαζόταν κιόλας! Ο χρόνος κυλούσε τόσο όμορφα χωρίς να έχεις την έγνοια του τηλεφώνου, της τηλεόρασης, των αγορών. Στη συνέχεια γυρίσαμε στο σχολείο. Σήμερα θα κάναμε κάποιες δραστηριότητες γνωριμίας για να γνωριστούμε καλύτερα με όλους τους μαθητές από όλες τις χώρες. Πιστεύω ότι αυτό έπρεπε να το είχαμε κάνει την πρώτη μέρα, όπως επίσης θα προτιμούσα να μη μας χώριζαν από την πρώτη μέρα σε group. Η γνωριμία θα έπρεπε να γίνει στην αρχή. Παρόλα αυτά, μέσα από τις δραστηριότητες που κάναμε δεθήκαμε πολύ με τα παιδιά, έστω και στο τέλος. Στο σχολείο μας είχαν ετοιμάσει ένα αποχαιρετιστήριο πάρτι. Παρόλο που δεν μ ‘αρέσει να εκφράζομαι μπροστά σε κόσμο, δεν άντεξα και ξέσπασα σε κλάματα. Δεν μπορούσα να συνειδητοποιήσω ότι αυτή η εμπειρία τελείωσε τόσο γρήγορα… Φάγαμε, ήπιαμε, γελάσαμε, διασκεδάσαμε, λες και αύριο θα ξαναβρισκόμασταν! Έλα όμως που όταν έφτασε η στιγμή να φύγουμε, δεν ξέραμε πώς να αντιδράσουμε και όλοι ήμασταν αμήχανοι… Το μόνο που θυμάμαι είναι ότι είπαμε ότι θα ξαναβρεθούμε. Όλοι μαζί κάποτε! Αυτό που θέλω να κρατήσω από αυτό το ταξίδι είναι σίγουρα τους ανθρώπους που γνώρισα και τις εμπειρίες που αποκόμισα! Είμαι σίγουρη ότι κάποια στιγμή θα τους ξαναδώ, όλους! Μια εμπειρία αξέχαστη για μένα που θα την κουβαλάω για το υπόλοιπο της ζωής μου! Our journey started at midnight on the 14th of May. 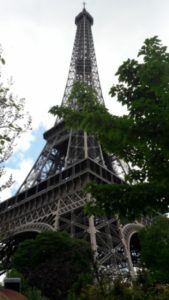 We arrived in Paris at around 9 a.m., but we were not in Alençon until 6 p.m. (Photo1) It was arranged for me to stay with Ocean in a smaller city, Argentan, where we arrived by car at 7:30 p.m. We had our first dinner and then we went to bed. I was sleeping in Ocean’s room, which was such a lovely and teen place. The first day, we woke up at 5:30 and had breakfast. Then, we went to the train station on foot and took our train at 6:43, exactly! I loved the whole train experience, because in Cyprus we don’t have these means of transport. When we arrived in Alençon, we took the bus and went to school. The bell rang at 8. This is when I first met the other students from the program. We all went to the city center and were separated into 2 groups. Each group had members from all countries. We had a walking tour in the city by a lady who lives in the town. We also visited the lace museum where we saw incredible pieces of lace. Then, a deaf guide and 4 students from the school guided us around the city. (Photo2) At 5 p.m. in the afternoon Ocean and I went back home and had a delicious French dish for dinner: quiche lauren, one of my favourites! On Tuesday, we went on a trip. 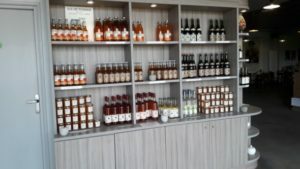 My group visited a cider museum. (Photo3) We saw how cider and apple juice is made. We had the chance to taste the apple juice and see the employees working. That’s when we first started to get to know each other. We talked with the students from the other countries and it was a lot of fun. Later, we went to a snail farm. We saw how they find, keep, and sell them. It was so interesting to know all these steps. On Wednesday, in the morning some students delivered a presentation on French food and it was actually very interesting, because they also showed us what they want to do as a profession. (Photo4) The school finished by 12 that day, so we had a free evening. I went to the supermarket with Ocean and her friends. We bought pizzas and lots of drinks and went to one of her friends’ house. We ate and had a lot of fun. Then, we thought of going for a walk to the shops but it started raining so hard we couldn’t even walk. So, we decided it would be better to go back to Argentan. On Thursday, it was a rainy day! We got to see the real weather of Normandy. (Photos5,6) In the morning, we went to a local market with a variety of French products. Then we returned to school, and had lunch made by the students! Later, we went to a magnificent place! It was so beautiful and it was even better because it was raining! 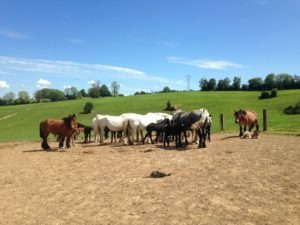 We visited the Haras du Pin stud farm. (Photo7) There were horses from all around the world and some of them even race. 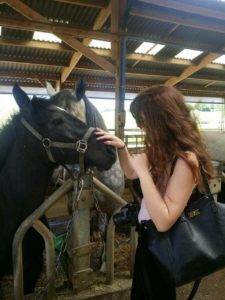 It was a very interesting visit, because we also got to see how the blacksmiths make the shoes for the horses. This day’s dinner was so special, because it was fully French! We had a first, second and third plate…all with crepes! On Friday, we were all at school by 8. All the foreign students went to the library, where we had a lot of games. We started by having a game with all our different languages. We would say the same phrases, in our mother language! (Photo8) Then we got separated into 3 groups and we had a little quiz about France. We didn’t win but I had a lot of fun! Afterwards, we saw two amazing presentations from the girls from Romania and Turkey. They showed us the culture, landscapes, cuisine and so much more of their countries. Later, we went to the town hall. The mayor of Alençon talked to us and he was very nice. Then, the Cypriot team offered him a reproduction of a Cypriot prehistoric figurine. We also had an hour of free time, where I got a little bit lost and my teachers had to come and pick me up. I wanted some more experiences! When we finally arrived at the school, after the little adventure, we all had lunch at the school canteen. And then… my favourite part of the trip: the “Speed Dating Game”! At that point we had the chance to actually get to know the other students, both from France and all the other countries. We were asked questions on how we like to travel, so that we find our travelling partner. I have to say… I picked everyone, because of the excitement! 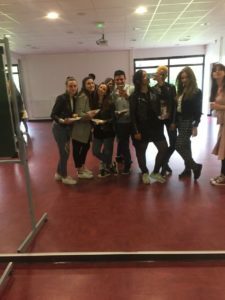 In the afternoon, all the students of the Erasmus+ were invited to a little party, where we had the chance to taste food from the other countries! (Photo9) When we had to leave the school, I was very sad. We all said goodbye and none of us actually wanted to leave… But Ocean made it up to me, because when we arrived in Argentan, she took me for a little tour there! This was my favourite day! On our last day, we had to take the train at 8 and leave Normandy. It was so sad that we had to leave, but we promised that we are all meeting again, somewhere! We arrived at Paris by 9 and we decided to take a little trip to Paris. We took a hop on – hop off bus and saw some of the amazing landscapes of the city. (Photo10) We sadly couldn’t finish the ride and so we took the metro and went back to the train station. We got our suitcases and took a bus to go to the airport. The journey back was quite tiring, but I took it as another part of our adventure! I finished my book, watched a movie, completed a math test… and the time flew by! Hi everybody, I’m Giovanni Rossi and I attend I.T.C.G “E.Fermi” in Pontedera. 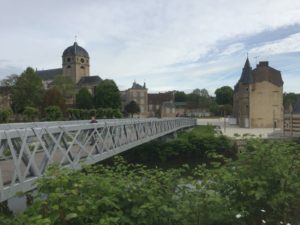 In May 2017 I took part in the Erasmus project “Foresee the Future” which allowed me to visit Alençon, a lovely town in the north of France. On the 14th of May our flight took off from Pisa and after one hour and a half we landed at the airport of Paris Beauvais. After the flight a shuttle took us to Alençon, in Normandy. There wemet our host families. I met mr Lamì, he is the coordinator of the Italian teachers of the region. We spent the afternoon walking through the city center and during the walk I got to know better my host. I can say that he was very kind and polite, always open to my requests. In fact we became friends and one evening he even took me to the cinema to see a movie. The following morning we visited the French High school involved in this project which is very big and divided into two buildings. One of the things I liked about this school is that it is full of laboratories: first aid laboratory, mechanical and technical laboratories, art and multimedia laboratories, places where students can learn a real job for their future.But the most intresting thing of the school is the shop; the school has a shop run by the economics teacher, where students work as employees and sell local products and Fair Trade goods. Portugal, Romania, Cyprus and Turkey. Thanks to these activities we had the opportunity to meet new people who were really nice. Besides we had a good time and we learnt new things. In the following days we did a lot of activities. We visited the Museum of Lace, because lace is very famous in this area in France and the town of Alençon. This experience was really interesting and touching because one of the guides was a disabled person who taught us some words in the sign language. 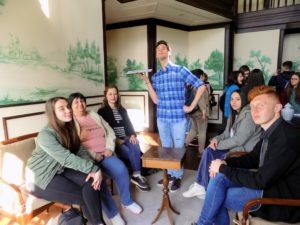 Some other interesting activities were the visit to an apple cider factory, where we got the chance to see how the cider was made in the past and how it is produced nowadays and to taste a delicius apple juice. Then we saw how and where snails grow. During a free afternoon, we visited the city of Le Mans. Le Mans is situated at about 60km from Alençon and it is very famous all over the world for the race called “24 hours of Le Mans”. I enjoyed this outing very much because and I am very passionate about motorsports. The city center of this city is really beautiful and interesting to visit. 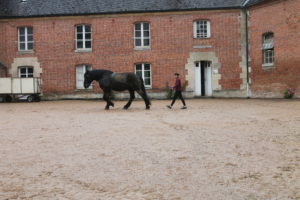 The second place I liked very much was the stud farm “Haras Du Pin” where beautiful horses live. Some of these horses were big and we also saw how horses’ hooves are hand made by the smiths of this stud farm. I really enjoyed the opportunity I had to meet new people, to speak English, to discover new traditions, a new culture, to see new places and to learn more about another European country. I hope, one day, I will meet again all the good people I met during this Erasmus mobility. Thank you Erasmus Plus for this wonderful experience! 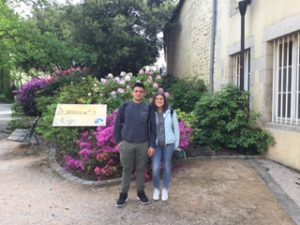 Two students of my class, Martina and Giovanni, and I took part in the mobility in Alençon from the 15th to the 20th of May 2017 for the Erasmus project “Foresee the Future”.We flew to Paris with two teachers of ours and there at the airport we met the Portuguese team and together we went to Alençon, which is an important town located in the Normandy region and north of Le Mans. This beautiful town is best known as a centre for lace production.Ms Martine Morel was waiting for me. I stayed at her place for a week.She works as a teacher and head mistress of a primary school where we carried out an activity with her pupils at the end of the week. 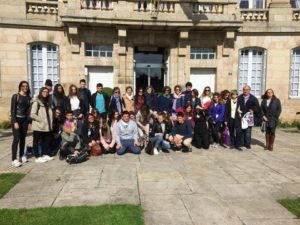 On Monday we visited the school and met the French students who showed us Alençon with the help of lady with special needs who explained to us the history of some monuments. Some pupils translated into English what the lady was saying in French. We saw the 16th century Basilica of Notre-Dame with its wonderful façade which contains a great deal of intricate stone carving, particularly around the entrance. Inside the church we could see the mosaics and stained-glass windows.In the afternoon we visited the Museum of Lacemaking where the guide explained how the lace was made.We also visited the Greenway, the Town Hall and two stud farms where we saw the production of natural products, such as body lotions or soaps, with the milk of the horses.Besides we met local producers in the Orne department who offered us an organic lunch which included French typical foods such as cheese, escargots, apple juice and so on. I enjoyed the activities at school related to First Aid and other interesting and useful activities. During the last day in Alençon, the pupils from Romania and Turkey showed us some presentations about their towns and countries. In the afternoon we did a test and some activities which helped us to socialize with students from the other Erasmus teams to find the perfect travel date.It was an unforgettable experience because I have improved my English, I have discovered the culture and the traditions of a foreign country and I have met wonderful people from France, Portugal, Romania, Cyprus and Turkey. anche quattro gatti, tre simpatici gechi e tre serpenti. il latte per produrre creme e saponette biologiche. posso affermare che tutto ciò mi è piaciuto molto. porterò sempre dentro di me. 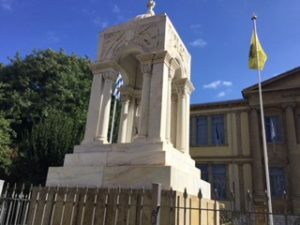 monumenti e musei da visitare. crescere molto e che ci aiuta ad allargare i nostri orizzonti. I am writing this at the airport while leaving this amazing country. My hand is shaking, that’s actually a lie, my whole body is shaking. I’m repeating the phrase “Goodbyes are not forever” to calm my emotions. Emotions that I’ve never felt before. I haven’t decided yet what this is. Is it an essay or a speech maybe? No. This is a letter. A letter to Portugal. To the magnificent cities, the beautiful seas, the unique culture but especially to the kind friendly and funny Portuguese because ultimately what made this trip unforgettable was the people. In my tears, I’ve already forgotten the reason I was writing this letter for. Oh yeah! To answer the most common question I get: “What will you miss the most from Portugal?” I think that I will miss a part of me. The part that I’ve left there hidden between the graphical alleys and the great unique architecture. The part I left in purpose to have an excuse to come back and walk on Ria’s coastline get lost in Porto visit all 8 of the gafanhas, swim in Costa Nova, eat Ovos Moles and francesinha and take a ride in a traditional Moliceiro. So, where will I find my missing self? Between the great acoustic of Casa de musica’s concert halls that made me listen myself and decide to follow my dreams? Or in a kayak in Ria that taught me to confront my fears and try something new. I might find me drinking in Sandeman Porto Wine Caves but please don’t say anything to the Erasmus teachers! The Portuguese that organised everything and the Cypriot teachers that accompanied us. A big thank you to all of them. They are the reason that I participated in such a well organised programme. Oh, I know where I’ll possibly be; In the chapel museum. The museum of porcelain where I learnt that what’s more fragile than a porcelain is a human heart that needs to be treated with respect, love and kindness in order not to break. I am still trying to decide if I’ll be climbing stairs of the Clerigos tower in Porto or the stairs of Barra’s lighthouse where I learned that climbing to the top offers you an incredible view but you must always be prepared that the steps are a lot and that the climbing is worth as much as the destination. I ‘ve decided to write something like a small journal about my visit to Portugal. The story began when one of my teachers Mrs. Sofia asked to see me. I wondered why she wanted to see me: “did I do something?” When I went to her office she told me about this programme and asked me if I wanted to take part in it. At first I said I would think about it as I wasn’t sure if I wanted to go. Then, I thought, why not? This is a life experience and I might not have the chance to take part in something like this again. So, I went and guess what! It was AMAZING! It wasn’t only the places and the sights that made me feel this way but the students of this programme and their families. All of them were so warm and welcoming and they wanted to know about me, my family, my country, my culture as much as I wanted to know the same things about them. I think that I can never describe my feelings about this experience. But I can tell you for sure that it changed me; I am not afraid to meet new people and make bonds anymore. I’m trying to find tickets to go back and see my friends and their families but it’s a little bit difficult because there is no direct flight from here to Portugal so I will have to change at least 3 flights. This time I want to take my twin sister with me so that she can see herself the beauty of Portugal. I really wish in the future to do this again. Maybe we could do something like a reunion! I would like to thank everyone who took part in this programme and the people who organized it because they gave us an opportunity to have an amazing life experience. “You never leave a place you love, you take a part of it with you…Leaving a part of you behind”. I decided to write this now that I haven’t calmed down yet. All those emotions and thoughts spinning around, lighting up the spark in our bonfire hearts, causing a chain reaction that tickles our bodies while our eyes turn red and wet, and there goes the tears burning our cheeks again, keeping us warm, like one of you is here with us, telling us that everything will be alright, telling us that whenever we need you, you are only “One call away”, that this is not the end. You showed us your country, you made us walk all those stairs so we can see for ourselves the beauty that is Portugal, Porto, Aveiro, Gafanha da Nazare and so on. From the first day we started to get to know each other; I can still remember the look on your faces, you wanted to know us, our country and our culture as much as we wanted to know yours. But of course that wasn’t enough. On the next day we went to Casa de Musica, one of the greatest music halls I have ever seen. Everybody would pay a fortune to be part of the audience in one of the concerts in order to enjoy the music but for us, a simple “good morning”or even better, a simple act of kidness like “I’m here. I’m listening. Tell me about it” was the greatest sound we heard. How will we ever forget the view from the bridge in Porto? Us walking, cars passing, the strong wind messing our hair, everything was part of a fairytale. All of these plus the music and the people and the colours and the taste of sweet cherry wine and the view combined together created one of the most romantic scenes I have ever witnessed, that was the moment we fell in love with Portugal. But of course that wasn’t enough. While I am writing this the schedule of what we did, the pictures, the “off the record” night outs, everything, is right in front of me. I see all those things and I don’t know where to begin or where to end, I don’t know what I liked the most, I don’t even remember on what day we did anything. Everything is a twisted mess in my mind and it’s hard for me to think straight. I can clearly remember faces, feelings, sounds and tastes and that is all I want to remember. I don’t miss the fine curves of your buildings and I don’t miss the way your cities and your roads are formed and I don’t miss a single statue I saw there. The greatest architecture and work of art was the way you smiled, all of you. This is what I missed. I missed you. All of you. All the fun we had together and the jokes we said all the painful and happy moments we shared with each other. Erasmus was never about the places, what would I do in the most beautiful city in the world if there are no people? People make a country great, and you made yours look like the greatest of all. But you can never miss somebody as much as you can miss them. In greek there is not specific translation to “I miss you”, we say «Μου λείπεις», which is closer to “You are missing from me”. I think it’s time to say thank you, or obrigado, however you want it. You gave us a chance to meet a new culture and by this you helped us get more experience and knowledge in our road to adulthood. We weren’t just stupid teenagers messing around in Portugal shopping and eating, we were stupid teenagers who learned, saw and felt. You weren’t just “Host families”, you were our brothers, sisters, mothers, fathers and nephews for a week. We felt safe being around you and we knew that you were by our side whenever and however we needed you. But the most amazing thing is that you are still by our side even when we are away. Now I want to take you back to the start. It’s the 2nd of April, 21:00 pm in Nicosia, and all those emotions and thoughts spinning around, lighting up the spark in our bonfire hearts, causing a chain reaction that tickles our bodies while our eyes turn red and wet, and there goes the tears burning our cheeks again. As we said in our “Goodbye Project”, you never leave a place you love, you take a part of it with you, leaving a part of you behind. And we left a part of us behind, big or small, it’s there, keeping you warm, like one of us is there with you, telling you that everything will be alright, telling you that whenever you need us, we are only “One call away”, that this is not the end. As you can see the fall from the fairytale to reality was rough. I said many things and I still feel that I haven’t said enough. I am supposed to attach some pictures with this. There are just so many but the best of them are those you will see when you close your eyes. So go for it, try it, close your eyes and see the pictures, feel the moments, recall the dialogues and let your imagination run wild, don’t let the fire disappear, it’s the only way one day we maybe see each other again, by keeping the fire burning. I don’t mean to say that we will cry all day, of course not! We should just not forget that the only thing between us is a plane ticket and some numbers on a mobile screen. Portugal has proved to be a very beautiful country from architectural, cultural and human point of view because it has a lot of beautiful buildings, especially â€œCasa da Musicaâ€, there are many cathedrals with beautifully decorated and clean interiors. I was very pleased with my host and his friends â€“ open, fun and friendly young people. I do not think anybody has ever noticed a sad person except when we were on the point of leaving from Aveiro railway station. I continue to be in touch with many of my new Portuguese friends because we share the same sense of humor, musical tastes and have interesting conversations. After almost a week spent in Portugal, I returned to Romania a bit sorrowful… I regret that I did not make the most of that week, I regret that I did not socialize more, but I am grateful to the wonderful people I have met there, but unfortunately I did not have much time to talk about lots of things. I took part in interesting activities, I visited many places and I walked a lot. After that week I do not have to go to the gym for at least 3 months! What I liked most in Portugal was certainly the city of Porto. It seemed to be a quiet city that delighted you from the beginning with its beautiful views “ a place where I would live happily. 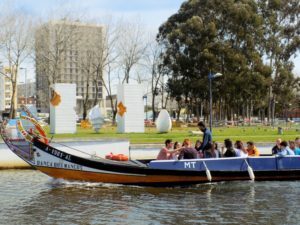 Another place I liked much was Aveiro “ with its breathtaking parks, its famous Moliceiro boats and simple but pleasant venues. I know that words are too poor to express mu feelings while I was there, but I can tell you that I would go back to Portugal whenever I had the opportunity. The Erasmus+ project provided every single one of us a different experience from what we were expecting, in a positive way. Not only did we meet new people from different countries but we also got to connect with them and each one of their cultures. We got to know new languages, new habits, new tastes and we got to make new friends. Some of us really made a connection, after all. This week, from the 26th March to the 1st April, was, without a doubt, a pleasant surprise to all of us and I can say for sure we’d repeat the experience all over again if we could. On the 26th March, it was the day of the arrival. Students from Cyprus, Italy, France, Turkey and Romania arrived to Portugal, probably just as scared as we all were. Personally, I didn’t get to be a host and have a student staying at my place. However, I know some people who did and, as far as I know, the connection started right there and then. They got to know the person who would be showing them around and we got to meet the person who’d be staying at our house for the entire week. Everyone was really excited and got along really well with each other and that was only the beginning. The next day, it was time to finally introduce our school. The staff distributed some t-shirts with the Erasmus logo and all of us looked like a genuine team, it was quite amazing to watch. We also got together in the staff’s room and participated in a workshop, in which a university teacher taught us all we need to know in order to succeed at a job interview. 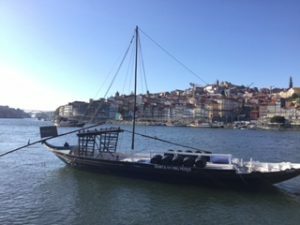 On the 28th March, we all got to visit Porto, one of the most beautiful Portuguese cities. Firstly, we visited Casa da MÃºsica, and most of us were amazed at its architectural style and Â complexity. We also went to a pastry shop where we bought some delicious croissants. Then, we walked around the traditional BolhÃ£o’s Market until it was time to have lunch. 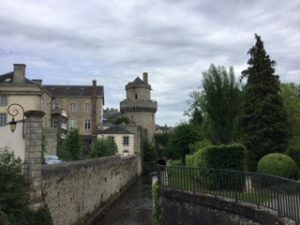 Afterwards, we visited the Clergymen Tower â€“ in fact, we climbed it until the very top – and the Sandeman cellars, where we were introduced to many things we didn’t know about such as the process of making wine and even conserving it. Although it was a beautiful day and, personally, I really got to meet many new people from the project, it was time to go home. On Wednesday, we went to Aveiro. Here, the Erasmusâ€™ students got to visit the university and know more about it and, more specifically, its tourism department. After that, it was time for a little trip in a traditional boat called the moliceiro. The rest of the afternoon was spent in the city so the foreign students got to know it a bit better. On the 30th March, we had the Erasmus+ students during our Spanish and Economics class and we all played a game in which one person had to guess the word written on the powerpoint presentation while the others gave tips about it. 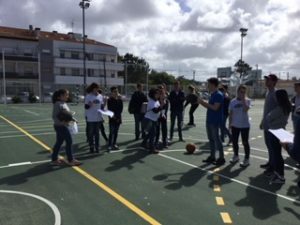 Afterwards, the students visited Vista Alegre in Ãlhavo and then came back to school to have lunch and reboot their energy, because we’d be climbing Â Praia da Barra’s lighthouse in the afternoon. We also visited the Maritime Musem in Ãlhavo and Costa Nova. The last day of the Erasmus+ project was a very emotional day. We all realized it was time to say goodbye and although we were happy and glad to have had this amazing experience, we were also saddened by the fact that we’d have to say goodbye to all of the friends we had made. To be honest, many of us cried. However, it was an experience I’d repeat all over again if I could. We got to get in touch w ith new cultures, new faces, new personalities and grow as people. Actually, some of us still talk with those we met, and I think that’s the most incredible thing about this project. It helps us learning not only about the professional life ahead of us but also about how to make a connection with people new to us and it taught us how to interact with different cultures and that one week is all it takes to make a good and long lasting friendship. First of all I really enjoyed this trip, I met nice people. Sandeman wine cellars which were really interesting. I hope I’ll be able to go back there in the future..
Il ne faisait pas beau. Nous avons rencontre notre famille d’accueil. Le programme touristique préparé par les élèves portugais était très intéressant. Les monuments étaient beaux, j’ai découvert la culture portugaise. Cela m’a plu. Nous avons visité Porto en gondole. J’ai beaucoup aimé. Sandeman m’ a beaucoup intéressé. For me, this was a totally new experience. Even though I was expecting an interesting experience, I certainly wasnâ€™t expecting it to be so amazing and enriching as it was! 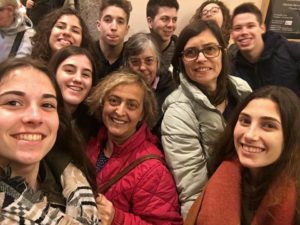 26th of March (Sunday): me and my family went to Aveiroâ€™s train station to welcome the student we were going to host: Andrea, from Italy. It was the first night we got to know him. 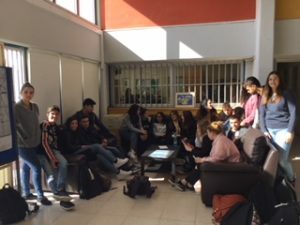 27th of March (Monday): this was the Erasmusâ€™ students first visit to our school â€œEscola SecundÃ¡ria da Gafanha da NazarÃ©â€, we all gathered in the school library and some members of the portuguese team did a presentation and guided the foreign students through the building. Then, we had a quick snack and went to the teachersâ€™ room to see a presentation which was very interesting and useful to our future. When we went back home, we decided to watch a movie to break the ice and get to know each other better. 28th March (Tuesday): this day was definitely my favorite! 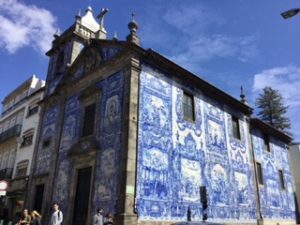 We went to Porto and even though Iâ€™ve been there so many times, it never loses its charm! We went to â€œCasa da MÃºsicaâ€, â€œMercado do BolhÃ£oâ€ and the â€œSandeman wine cellarsâ€ and it was amazing! This was the day when we started to get more comfortable with each other and took a lot of pictures. I loved the fact that I was learning so many things about the Italian culture and so many different words. 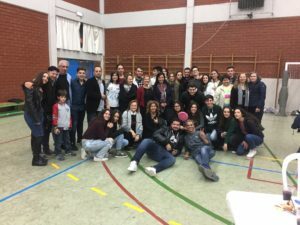 29th March (Wednesday): this was the day of the visit to Aveiro. I only had the chance to meet the Erasmusâ€™ students during the afternoon. We went to â€œFeira de MarÃ§oâ€ and had a lot of fun by trying all the different attractions! 30th March (Thursday): we went to Vista Alegre. Having the opportunity to visit the interior of the new hotel and learning its history Â was very interesting! The factory was also amazing, especially because you could see the painters work. We were all getting along so much better! 31st March (Friday): unfortunately, this was the last day. All the foreign students put together some incredible works with their best memories and pictures! We also had the chance to see some videos with all of the photos from these 5 days. After tea, it was time to go. We said our goodbyes and this amazing and incredible experience in Portugal came to an end. I loved meeting everyone. Even though we all come from very different cultures, we were able to get along very well and put our differences apart. The student I hosted was super nice! He wasnâ€™t shy and we were always talking about something, trying to learn as much from each other as we could! Me and my family loved to have him with us! This project really was life changing! I improved my social skills and my English! Thank you everyone for this opportunity! PORTEKİZ gezimizde çok eğlenceli ve güzel vakit geçirdim. Orada gezdiğimiz yerler çok hoşuma gitti özellikle PORTO’yu çok sevdim orada çıktığımız kiliseden şehir çok güzel görünüyordu PORTEKİZ deki insanlar çok samimi ve eğlenceliler. Orada tanıştığım arkadaşlarım bizimle çok iyi ilgilendiler. To start with, I‘d like to say my stay was wonderful, because I met a lot of friendly people. I love my pen friend Dulce, she becomes my friend, a real friend and I don’t regret it. I like a lot her family too, they’re so kind and funny. 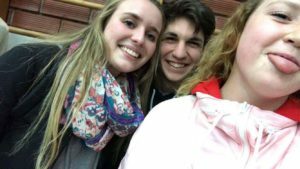 Erasmus + allows us to meet a lot of different people. 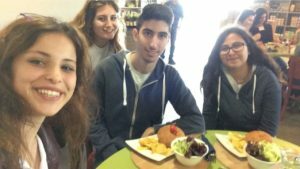 For example, I met two Cypriot girls Loukia and Athina and they invited me to go to Cyprus. This European programme is a good way to socialize. And for me, It is good to show that we are European citizens. Portugal and its landscapes are amazing, I would like to go back there. I enjoyed sightseeing in Gafanha Da Nazaré, I spent a good time there. I would have liked to stay one more week. Now, I’m eager to welcome my Portuguese friend, Dulce. Hace unos meses, fui elegida por mi instituto “I.T.C.G. 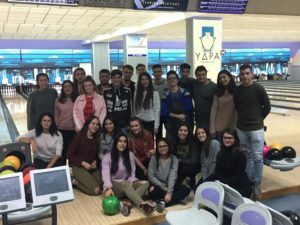 E.FERMI” para participar en el proyecto “Erasmus +”. Fuimos cinco los estudiantes que nos dirigimos a Portugal, salimos el 26 de Marzo y volvimos el 1 de Abril. 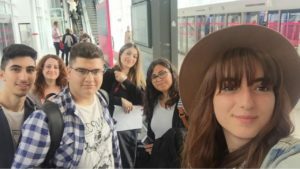 El primer día cuando llegamos a Portugal, las familias que nos tenían que albergar, nos esperaban fuera de la estación del trenes. Fue una emociòn extraña pero curiosa, todos estábamos cortados y no sabíamos cómo comportarnos entre nosotros. Todo mejoró cuando llegué a casa de la familia de Maria Joao Eugénio que me acogió con los brazos abiertos y me sentí como si estuviera en mi casa. Me llevaron a cenar a fuera para festejar mi llegada, fuimos a un centro comercial de Aveiro lleno de restaurantes.Durante la cena hablamos mucho para conocernos más, fue una linda noche y nos divertimos mucho. El segundo día, durante toda la mañana, estuvimos en el instituto “ESGN” de Gafanha de Nazaré donde nos acogieron con un enorme bufé. 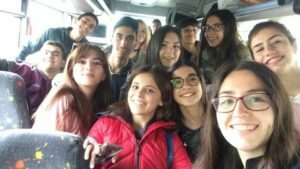 Allí realizamos distintas actividades que nos sirvieron para hacer amistad con los otros chicos de nacionalidades diferentes y sinceramente nos ayudó mucho. 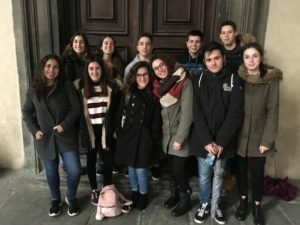 Éramos estudiantes de seis nacionalidades; portugueses, italianos, franceses, chipriotas, turcos y rumanos. 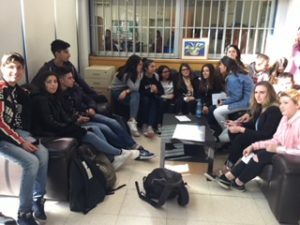 Después fuimos a comer todos juntos en el comedor del instituto y a las 15.00 salimos para practicar piragüismo.Muchas personas no lo hicieron porque el agua estaba muy pero que muy fría, pero cinco personas se atrevieron a probarlo. 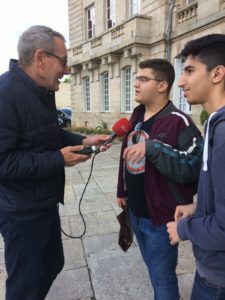 Esta experiencia era solamente para los chicos de otras nacionalidades por eso los chicos portugueses se quedaron en el instituto.A las 18.00 volvimos a la escuela para encontrar a los estudiantes portugueses y volver a casa. Comí en casa de mis anfitriones que me cocinaron el plato típico de Portugal que se llama “ el bacalhau”. Esta comida me encantó, ¡estaba muy buena! El tercer día fuimos a Porto, ¡una de la ciudades más bonitas de Portugal! visitamos el Boémia cafè, la Casa de Música, el tradicional mercado de Bolhao, la famosa calle Caterina y las bodegas de Sandeman donde probamos el típico vino. Además vimos el mar, que era espectacular y ¡me gustò mucho!A las 20.00 llegamos a casa y comimos la típica cena italiana, mi amigo me cocinó los espaguetis a la carbonara y tengo que decir que el padre de María Joao es un excelente cocinero. 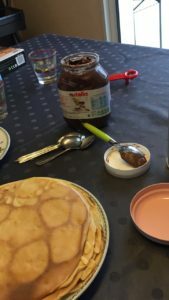 Después de la cena me llevaron a probar la tripa, un dulce que se parece a los “crepes” pero es más grande y mucho más bueno. 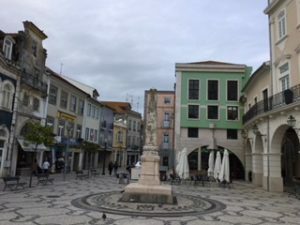 Dentro le puedes poner lo que quieras y por eso es muy especial.El cuarto día nos fuimos a Aveiro, conocida como la “Venecia portuguesa”, es un pueblo cerca de Gafanha da Nazaré, que se encuentra a pocos minutos y por eso los chicos van siempre allí. En Aveiro visitamos la universidad y el parque de Macaca, además hicimos un tour en un barco llamado “ Moliceiro” y pudimos admirar toda la belleza de este pueblo. Durante el tour el responsable del barco nos regaló la típica sal que usan los portugueses y nos hizo probar los tradicionales dulces de Aveiro que son los “Ovos Moles”. Después de comer nos dirigimos al centro comercial y fuimos de compras.A las 16.00 los chicos portugueses nos llevaron a una feria que se hace todos los años en Marzo, es una feria llena de juegos y jugamos todos juntos como si fuéramos de la misma nacionalidad. Fue el día más bonito de todos. Me divertí muchísimo y lo volvería a hacerlo mil veces.Maria, Catarina, Anna y yo nos quedamos a la feria porque sus familias nos fueron a buscar para cenar todos juntos. ¡Fue una linda noche! El quinto día estuvimos en Ílhavo donde vimos la fábrica Vista Alegre, una fábrica muy especial donde 17 pintores decoran piezas de cerámica.Después de la visita hicimos una entrevista a los chicos portugueses sobre la historia de esta fábrica, fue muy interesante. Hemos aprendido muchas cosas nuevas.A las 12.30 volvimos al instituto para comer, comimos en el comedor todos juntos y a las 14.00 fuimos al museo marítimo de Ílhavo donde vimos el bacalhau, que son peces enormes y también muy buenos. A las 17.00 nos dirigimos en la playa Costa Nova y a las 18.00 volvimos a casa para cambiarnos porque a las 20.00 teníamos que ir a casa de Carolina para cenar todos juntos. Pasamos la noche hablando y jugando con la playstation, nos divertimos mucho.El último día estuvimos en el instituto para realizar diferentes actividades para concluir esta experiencia, al final de la mañana todos teníamos un póster donde habíamos escrito lo que más nos había gustado de Portugal. Almorzamos en el comedor del instituto y por la tarde jugamos divididos en grupos mixtos de nacionalidades. Mi grupo llegó segundo pero no me importò mucho porque lo único que nos importaba era divertirnos. Al final llegó la hora de regresar a Italia, fue la despedida más dolorosa de todas. No queríamos volver a Italia porque nos habíamos encariñado con los chicos portugueses y ellos también con nosotros. Lloramos durante toda la tarde y nos prometimos que un día nos volveríamos a ver.A las 20.00 llegamos al hotel y al día siguiente cogimos el avión para volver a casa.He tenido muchísimas experiencias pero esa ha sido la mejor de todas. He conocido a nuevas personas, he aprendido una nueva cultura y también he aprendido que podemos ser amigos aunque seamos de diferente nacionalidad. Todavía echo de menos a los estudiantes portugueses, aunque hablamos trámite Whatsapp… pero no es lo mismo. ¡Espero de todo el corazón que el próximo año puedan venir a Italia! ¡Obrigado chicos, obrigado Erasmus! 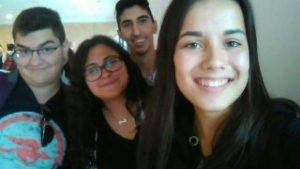 Desde el 26 de Marzo hasta el 1 de Abril llevé a cavo mi segunda experiencia de intercambio cultural con Portugal, esta vez con Erasmus. Por supuesto ha sido una experiencia extraordinaria.En primer lugar las personas que me rodeaban, tanto si pertenecían al proyecto o no, fueron muy amables con nosotros, trataban siempre de incluirnos en las conversaciones que realizaban entre ellos. 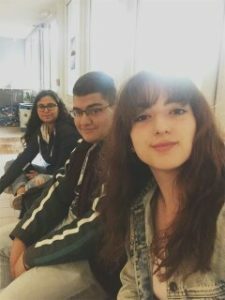 El día 27 día nos reunimos en la biblioteca del instituto e hicimos una actividad para romper el hielo, que en mi caso funcionó, porque más o menos me relacioné con todos los demás estudiantes. Después nos mostraron el colegio. Lo primero que me impresionó fueron sus modernas instalaciones en comparación con los institutos de mi zona. Por ejemplo había un laboratorio de bicicletas que servían para realizar un proyecto. El día 28 nos fuimos a Oporto y visitamos muchos lugares, como la “Casa da Música”, una casa de conciertos que, con su modernidad, destacaba entre los demás edificios antiguos del centro de Porto. También el mercado tradicional de Bolhão, que parece que se encuentra en algún país medio oriental, me pareció muy bonito. Más tarde comimos con los otros jóvenes portugueses en Santa Catarina Street. Después disfrutamos de una maravillosa vista de Oporto desde la Torre de los Clérigos.En la bodega “Cuevas de Sandeman” una guía muy simpática nos explicó cómo producen el vino. Durante la cena con la familia que me alojó empecé a tener más confianza y dejé mi timidez. El día 29 en Aveiro visitamos la universidad y hicimos un viaje en “moliceiro”, un barco típico, por los canales de la ciudad. Allí comí por primera vez los “Ovos Moles”. Teníamos la tarde libre, así que los portugueses nos propusieron ir a la feira de Março, y allí me divertí un montón, ¡fué la mejor tarde de la semana! 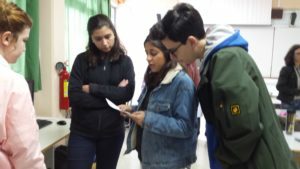 El dia 30 a Ílhavo visitamos la fábrica “Vista Alegre” y nos mostraron el laboratorio donde se realizaban las obras. Los que trabajaban necesitaban silencio completo. Por la tarde fuimos a la playa de Barra, subimos al faro y nos quedamos encantados por la vista que teníamos desde allí arriba. En Costa Nova comí “La Tripa”. ¡era deliciosa! 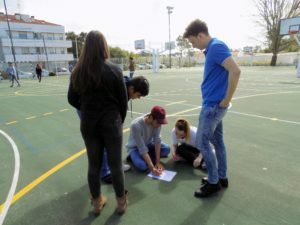 El último día nos quedamos en el colegio, jugamos a algunos juegos y cada grupo preparó un trabajo “The Best Of Portugal”. Por la tarde empezamos a despedirnos viendo un video que resumía toda la semana. Después de una linda fiesta con comida, música y bailes llegó la hora de despedirse, fuè la peor parte, porque todos estábamos tristes y la mayoría lloramos, pero con la sonrisa en la cara. Este intercambio ha superado mis expectativas, nunca había pensado llevarme tan bien con gente nueva y no tenía ganas de volver a casa. Por eso quiero manifestar mi agradecimiento a todos los que han contribuido a hacerme pasar, hasta ahora, una de las mejores semanas de mi vida. Seguramente si alguien me preguntara si me gustaría volver a hacer este viaje, mi respuesta sería un gran ¡SI!, y no lo pensaría un segundo. I can say that this experience has changed me a lot because it opened my mind. Not only because I improved my English but also because I got to know new cultures and very friendly people. The Erasmus week made me feel part of something awesome and really important. In that week I felt I was doing something good to myself and others. 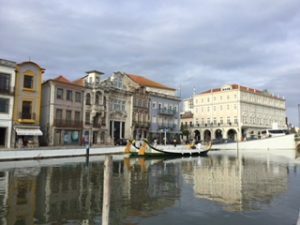 We arrived on Sunday 26th March in Aveiro. Our host families met us at the railway station and gave us a very warm welcome. 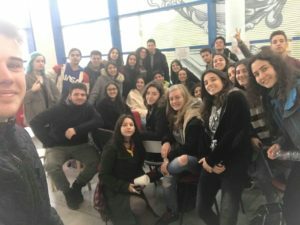 On Monday 27th March we went to school “ Escola Secundária da Gafanha da Nazaré” where we had a meeting with the students and teachers of the other countries that participate in the Erasmus project (France, Cyprus, Turkey, Romania, Portugal, Italy). Besides we had the school teams presentation and the workshop “First Rungs on the professional ladder” and in the afternoon we enjoyed some sailing activities. In my opinion, the most fun day of the Erasmus week in Portugal was Tuesday 28th March, when we visited Porto, an awesome city, rich in culture. We saw Casa da Música, an amazing and innovative building, we visited Mercado de Bolhão and admired the beautiful landscape of Porto from Torre dos Clérigos. In the afternoon we saw the district of Ribeira which is made up of medieval streets. It is a fascinating place, ending at a riverfront square (“Praça da Ribeira”). From Ribeira you can also see some Port Wine houses across the river. We had a guided tour in the Sandeman cellars, famous for their Porto wine, produced exclusively in the Douro Valley in the northern provinces of Portugal. We tasted it… a real delight.On Wednesday 29th March we visited Aveiro by a typical boat, called the Moliceiro, which has a particular shape and has very beautiful drawings. 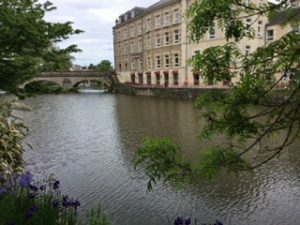 It was fascinating to see the old part and the new part of this beautiful town, and its university, famous in Europe for his courses on Tourism and for its Erasmus projects. 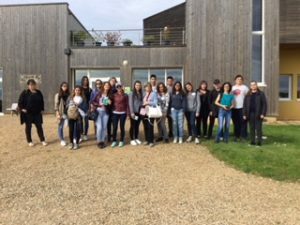 On Thursday 30th March we visited Vista Alegre complex, the museum, the porcelain factory, the hotel, situated on the outskirts of Aveiro. It was a very interesting place, full of history and innovation, and it was nice to see, in the porcelain factory, how the production process takes place and the beautiful decorations of their pieces. In the afternoon we visited the Maritime Museum of Ílhavo, Barra’s Lighthouse, Costa Nova, famous for its colourful striped houses and beaches. 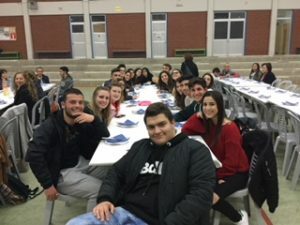 At school, we did a lot of interesting and sometimes fun activities, where we were all involved and which helped us socialize.It was great to meet the Portuguese students, our host families and the students from the other countries. We talked about many things, we shared our ideas and our experiences. We discovered the culture of Portugal, its traditions, its food and its wonderful towns and villages.It was all so great and I can’t wait to make another experience like that.Thanks to this experience and the people I met (my new friends and my host family), I have learnt to love Portugal and for this reason I left a piece of me over there.Anyway, in my opinion this kind of projects are really important to our lives right now and to our lives in the future. So, if anyone gets the opportunity to participate in this or any other project, they should take it! This Erasmus Project hasn’t only improved my English, but it has improved my life! I started this experience with an idea of what it would be and it was completely different from what I had thought. 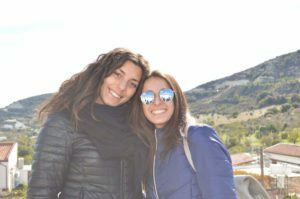 With this Erasmus project I had the chance to travel to another country, different from mine and I couldn’t have liked it more. I discovered a wonderful new culture that only enriched me as a person and made me become a better person. 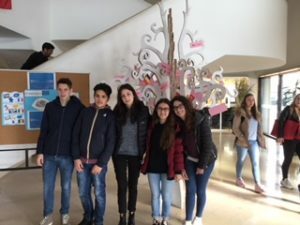 On Monday 27th March we met the students and teachers from Portugal, Turkey, Romania, Cyprus, Francein the library of the Escola Secundària da Gafanha da Nazaré near Aveiro. Itwas the first meeting with thepartners of the Erasmus project.The Portuguese team and the school staff gave us a warm welcome and a very nice t-shirt with the logo of our Erasmus“Foresee the Future”.So I really felt a member of a team.The Portuguese team organised a wonderful week full of activities related to tourism and the world of work. Two university teachersshowed us some powerPoint presentations about the most important things and skills we need to learn and have for university and for our lives and gave us useful tips on how to get ready for a job interview. It was very interesting. During the week the Portuguese team organised some excursions for us and some Portuguese studentswere our tour guides. We visited several places: Aveiro, Porto, “Vista Alegre” Factory and Museum, the Maritime Museum of Ílhavo, Barra’s Lighthouse, Costa Nova and we saw the Atlantic Ocean.The places that I enjoyed the most were Porto and Aveiro. In Porto we visited Casa da Música(a special building for concerts and performances)andthe wine cellars ofSandeman (famous for itsport wine). The sight of the Bridge Dom Luís(planned by Eiffel) was unforgettable.We could admirethe beautiful district of Ribeira from that fantasticbridge. 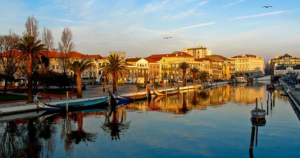 I liked Aveiro for its lagoon. Wealso had the opportunity to go on a trip by the traditional boat called Moliceiro. We spent our last day, Friday 31st March, at school with our new friends from Portugal, Turkey, France, Romania, Cyprus. The saddest moment was when I realized that this amazing experience was about to end and that I had to leave Portugal and my new friends. 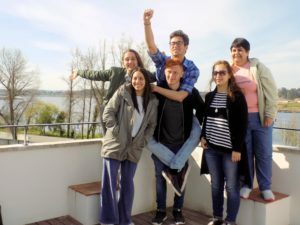 After this experience I can say that this Erasmus+projecthas changed my life, has opened my mind because this project made me live in a different ‘reality’. This experience helped me to improve my English, to see the world, people and things in a different way. When I was in Portugal I started accepting a new way of living, a new culture, and the ability of respecting other people was developed. Thanks to my fantastic Portuguese friends I felt part of another European country, although different from mine. Now I am proud to be a European citizen. 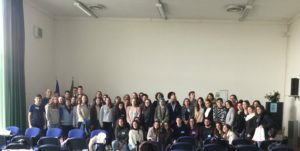 Dal 26 marzo al primo di aprile ho avuto la possibilità di andare in Portogallo per partecipare al primo incontro del progetto Erasmus plus “Foresee the Future”, che coinvolge studenti italiani, portoghesi, rumeni, turchi, ciprioti e francesi.Ho soggiornato in una famiglia di un ragazzo portoghese della mia età, a Gafanha da Nazarè, e ho avuto l’opportunità di scoprire la loro cultura, i loro piatti tipici e il loro modo di vivere. Le famiglie ci hanno accolto alla stazione e ci hanno portato nelle loro case. Inizialmente ero un po’ triste e dispiaciuto perché avevo la febbre e sono dovuto andare subito a letto ma già la mattina dopo sono stato meglio. 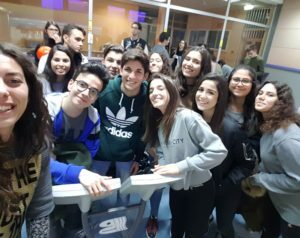 Il secondo giorno abbiamo visitato la loro scuola e fatto un gioco per conoscerci meglio. Devo dire che è stato molto divertente e sicuramente mi ha aiutato a migliorare il mio inglese e addirittura ad imparare qualche parola in portoghese e nelle altre lingue parlate dai ragazzi degli altri Paesi.Nel pomeriggio siamo andati a fare kayak, anche se non molti hanno avuto il coraggio di andare nell’acqua visto che era molto freddo e c’era vento. La sera, come tutte le altre sere, cenavamo in famiglia, era un momento per parlare con loro e scoprire cose nuove. 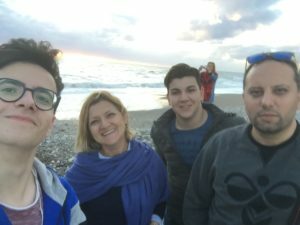 Sono stato molto contento di essere stato in quella famiglia per una settimana perché sono stati tutti molto gentili e disponibili, infatti sono stato accolto davvero bene, quasi come se facessi parte della loro famiglia da sempre. 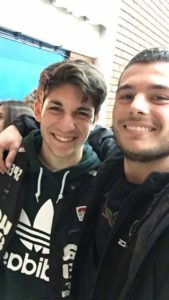 Con i genitori di Miguel, il ragazzo che mi ha ospitato, non è stato molto facile dialogare, perché non sanno l’inglese, ma è stato divertente provare a parlare e capire il portoghese e in qualche modo ci capivamo utilizzando anche lo spagnolo. 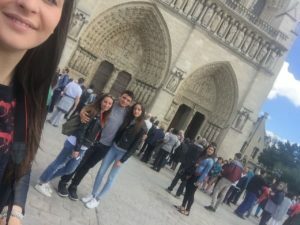 Miguel ha due sorelle che mi hanno aiutato molto ad interagire con la loro mamma e mi hanno parlato della storia del Portogallo e di tutti i luoghi più famosi da visitare, come delle vere e proprie guide. 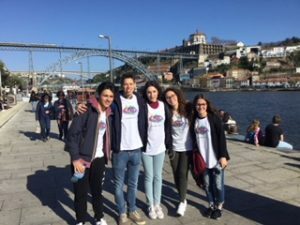 Il terzo giorno abbiamo visitato Porto, una gita bellissima, con le guide (i ragazzi della scuola portoghese con cui abbiamo fatto molta amicizia), che avevano organizzato tutto alla perfezione. Il tour comprendeva la visita a Casa da Música, che mi ha affascinato per la sua versatilità, visto che può accogliere diversi tipi di spettacoli, il mercato tradizionale di Bolhão e la visita alla Torre dos Clérigos. Nel tardo pomeriggio invece abbiamo avuto l’opportunità di visitare le cantine Sandeman e assaggiare il Porto. 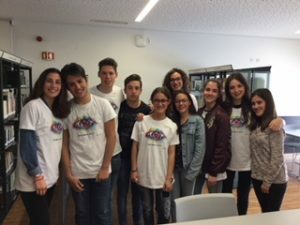 Il quarto giorno siamo andati ad Aveiro, dove abbiamo visitato il dipartimento di Lingue e del Turismo dell’università dove ci hanno spiegato molto bene il piano di studi e le varie attività che organizzano. È stata una visita molto interessante, che mi ha fatto venire voglia di proseguire dopo il diploma. 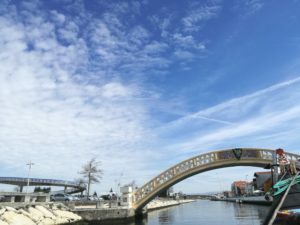 Inoltre abbiamo fatto un tour con la tipica barca chiamata “moliceiro” lungo il canale della città di Aveiro, che dicono sia la “Venezia portoghese”. Nel pomeriggio siamo andati tutti insieme alla “Fiera di Marzo”. 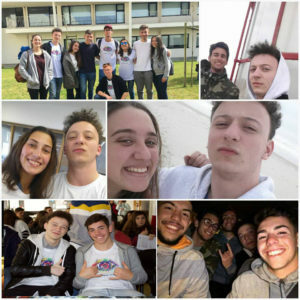 Questo è stato uno dei momenti più belli di tutta la settimana perché ci siamo divertiti molto, abbiamo scherzato tutti insieme e lì ho capito veramente che non conta niente se due persone non parlano la stessa lingua e hanno culture diverse perché possono comunque divertirsi e passare del tempo insieme, come se fossero della stessa nazionalità. La sera, dopo cena, siamo andati in un pub con altri ragazzi rumeni e ciprioti e ci siamo divertiti tantissimo. Mi sembrava di parlare con i miei amici, come faccio quando sono a casa mia in Italia. 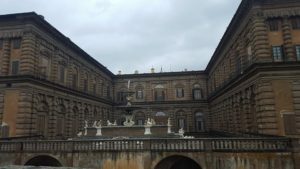 Il giorno seguente abbiamo visitato il Museo della Porcellana, la fabbrica e l’hotel ‘Vista Alegre’ e una studentessa del team delle guide mi ha fatto una piccola intervista dove dovevo dire quello che mi era piaciuto di più della visita a Porto. Nel pomeriggio abbiamo visitato il Museo Marittimo di Ílhavo, siamo saliti sul faro più alto del Portogallo, facendo 275 scalini: è stato faticoso, ma la vista arrivati lassù ci ha ripagato dello sforzo. Abbiamo visto le caratteristiche case del mare a Costa Nova dove abbiamo potuto assaggiare las tripas, una specialità locale simile alle crêpes; è stato molto divertente quando i ragazzi portoghesi ci hanno insegnato a ordinare in portoghese e lo abbiamo fatto da soli. L’ultimo giorno abbiamo fatto dei giochi a scuola. Mi ha fatto molto piacere essere in gruppo con un ragazzo turco diversamente abile, perché ho capito che nonostante avesse delle difficoltà provava a parlare in inglese e ad interagire con gli altri. Alla fine era molto triste perché siamo arrivati secondi, ma gli ho detto che l’importante era partecipare e così ha iniziato a ridere. Nel pomeriggio, prima di partire per Porto, abbiamo fatto un incontro di disseminazione del progetto, invitando alcuni rappresentanti degli enti locali e concludendo con un buffet di arrivederci. Salutandoci, mi è scappata qualche lacrima e se penso di nuovo a quella settimana in Portogallo, piangerei anche ora, perché è stato tutto bellissimo e ancora adesso non riesco a capire come sia possibile affezionarsi in così poco tempo a delle persone che non si conoscono.Ci tengo a ringraziare le nostro professoresse Mori e Intrivici che ci hanno accompagnato, le professoresse portoghesi che sono state bravissime e gentilissime e tutti i ragazzi che hanno partecipato al progetto. Non vedo l’ora di accogliere tutti i ragazzi qui in Italia per passare un’altra fantastica settimana.